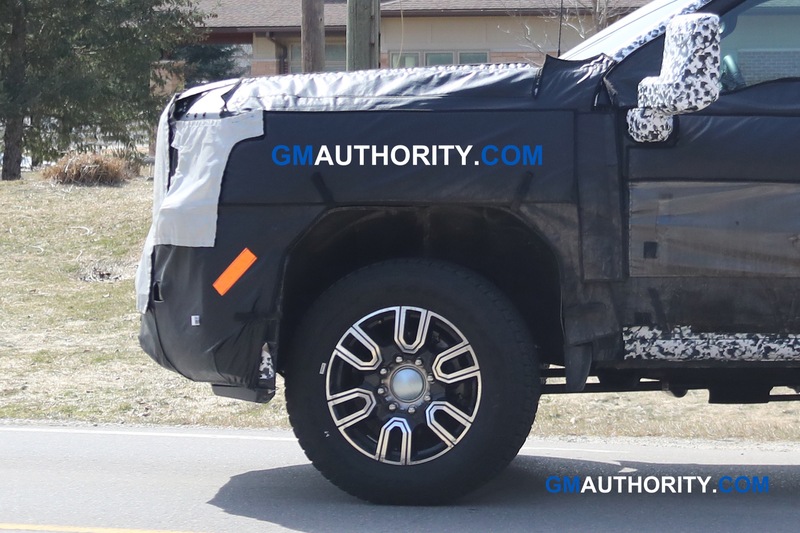 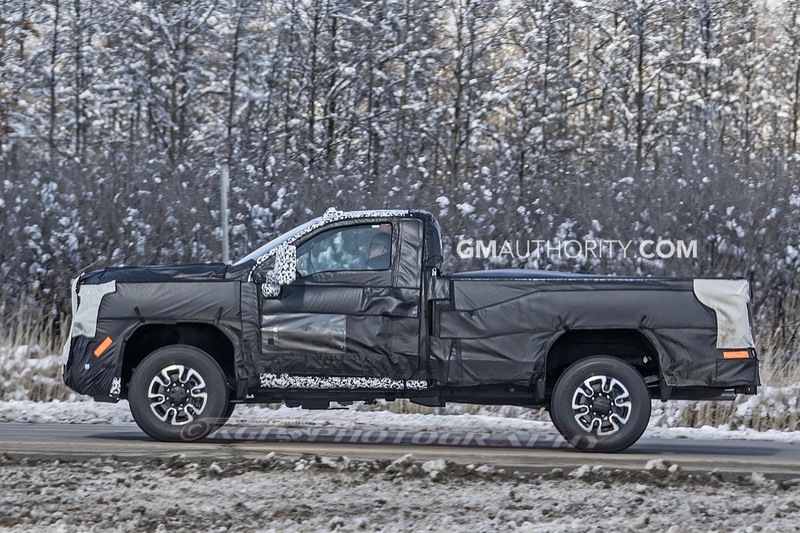 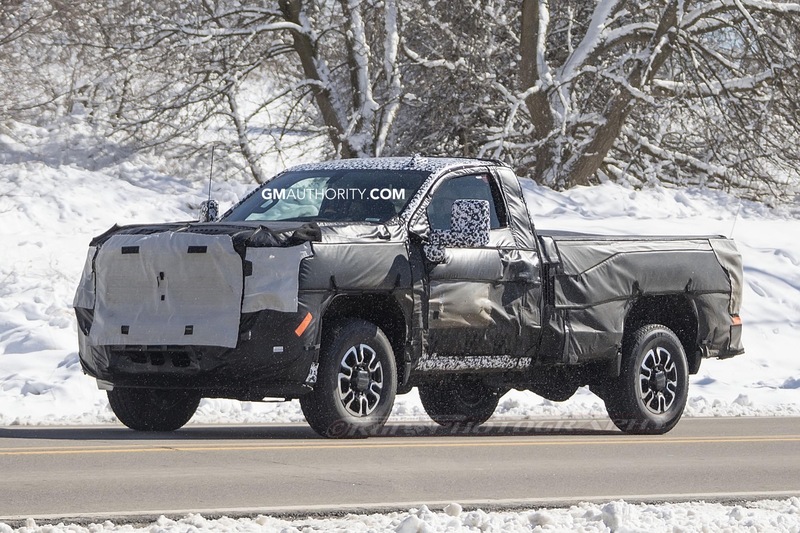 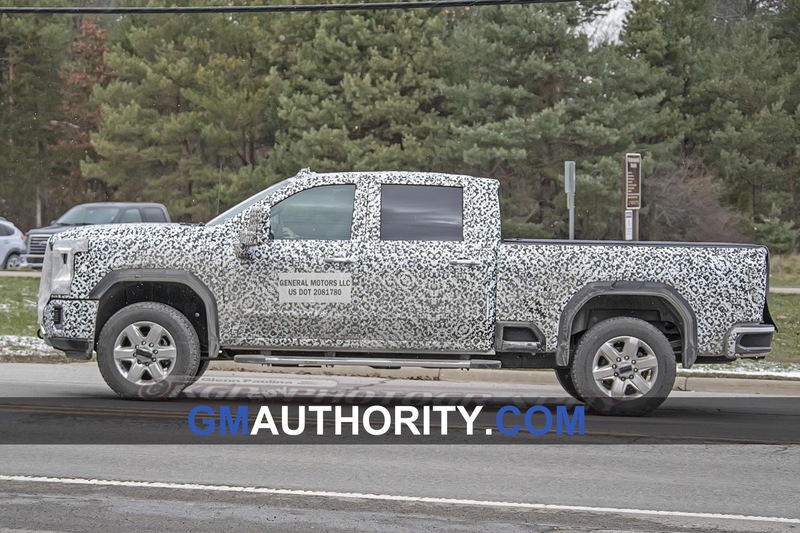 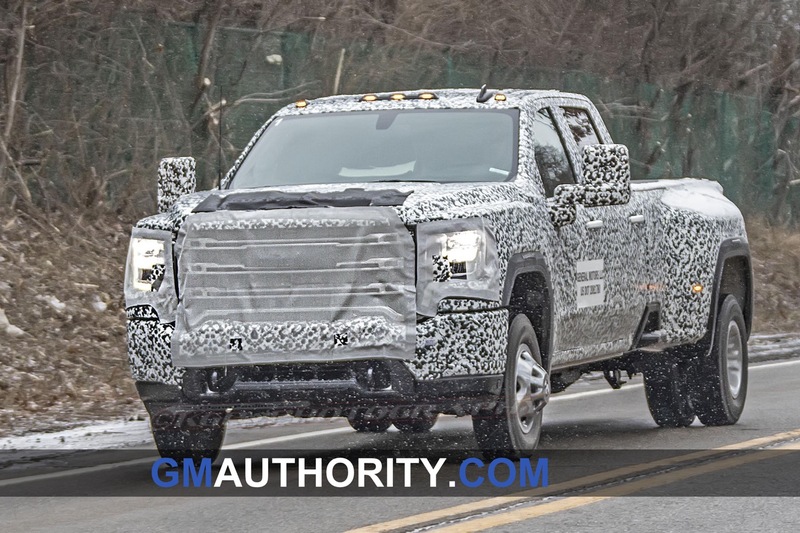 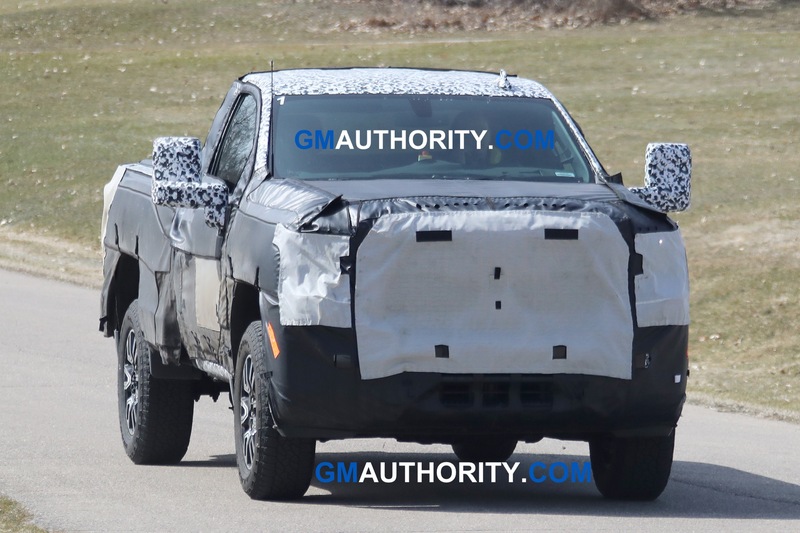 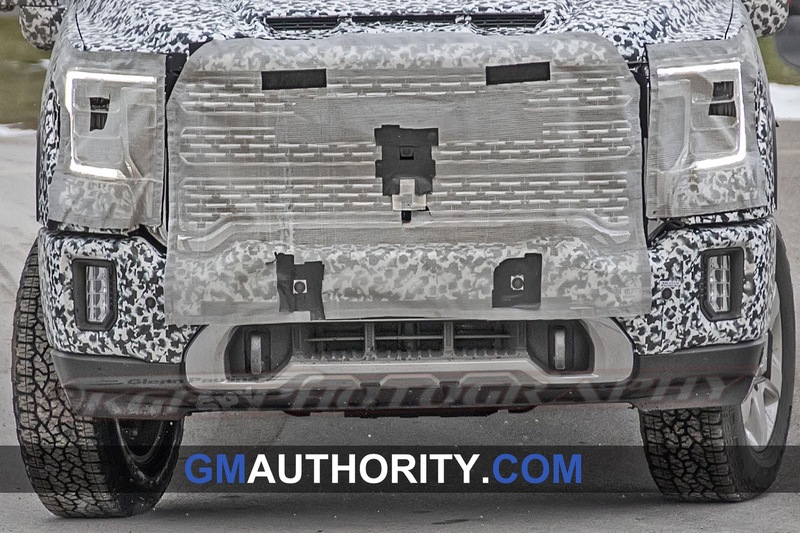 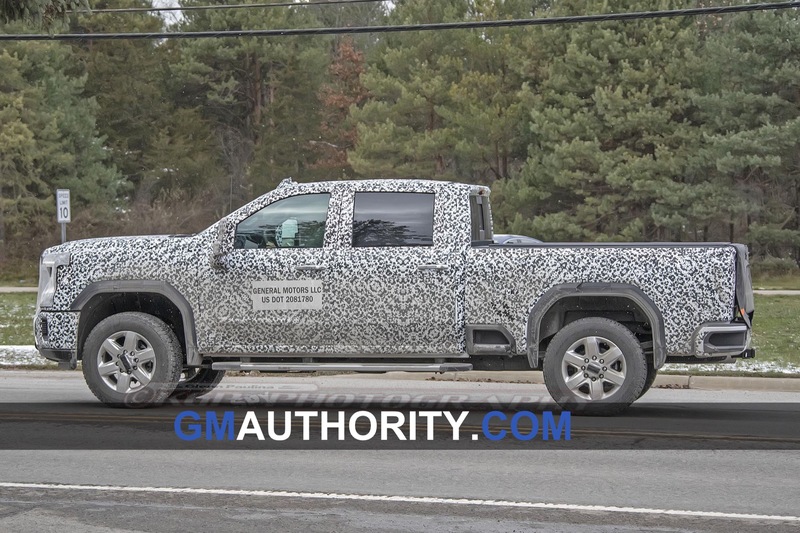 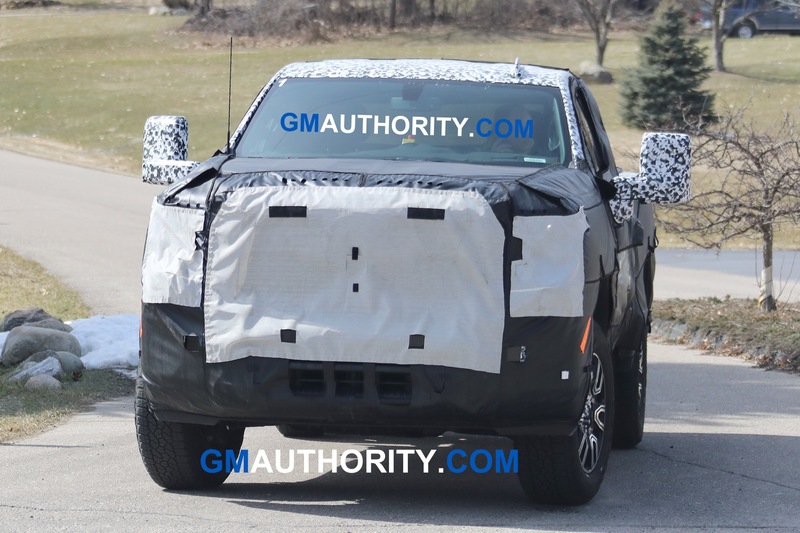 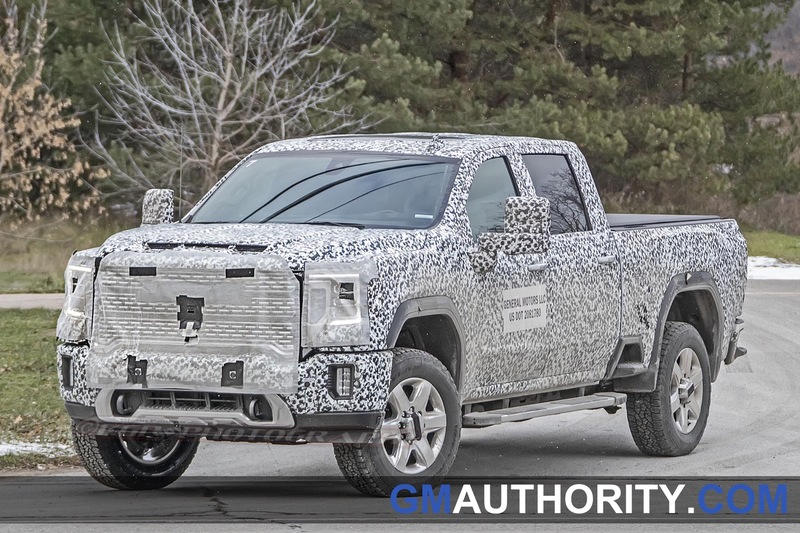 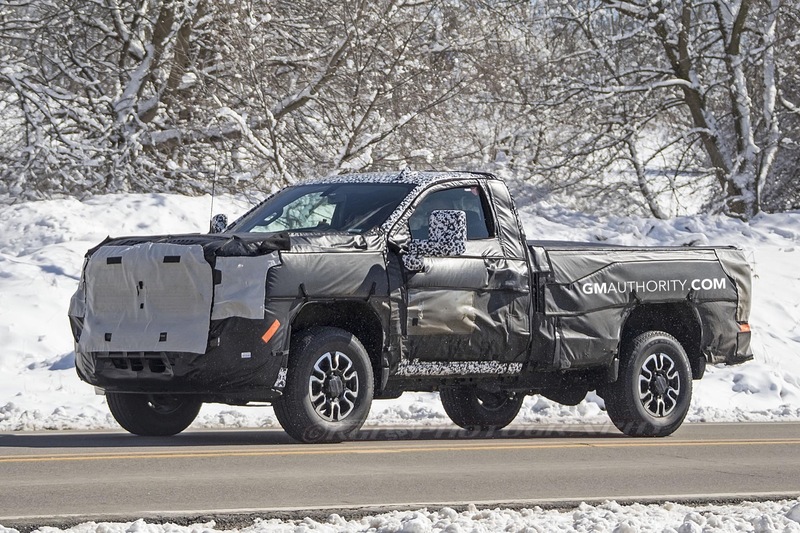 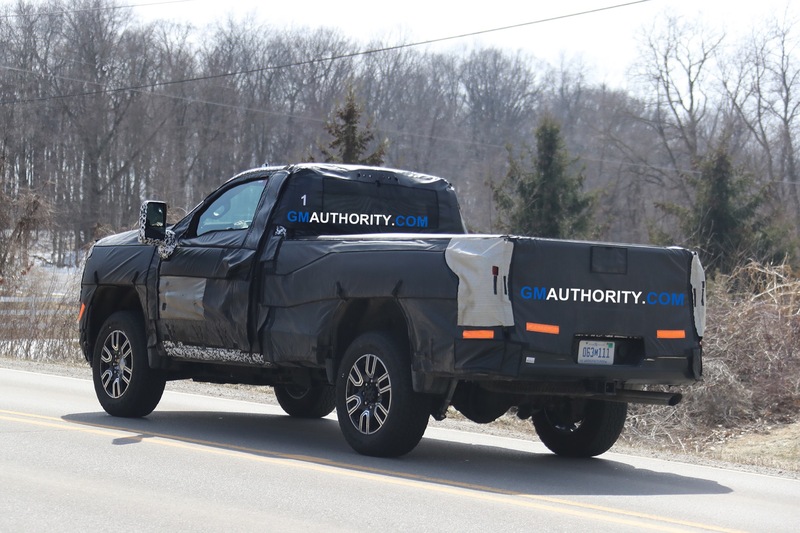 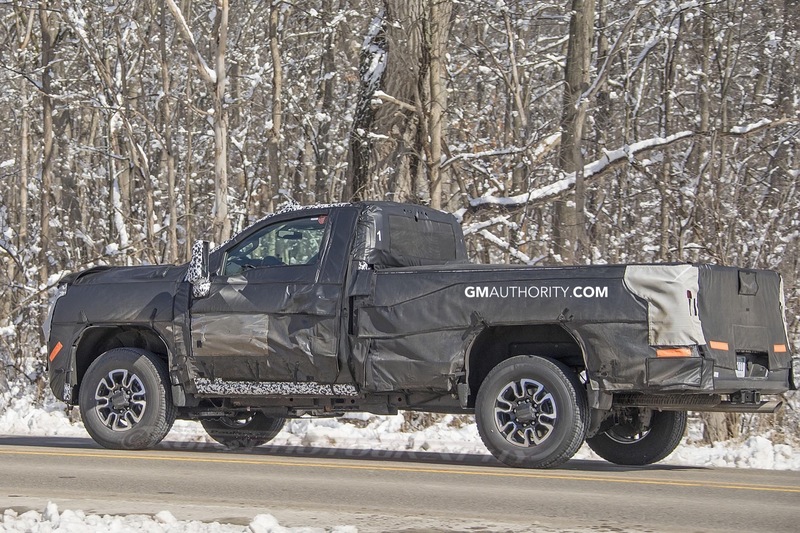 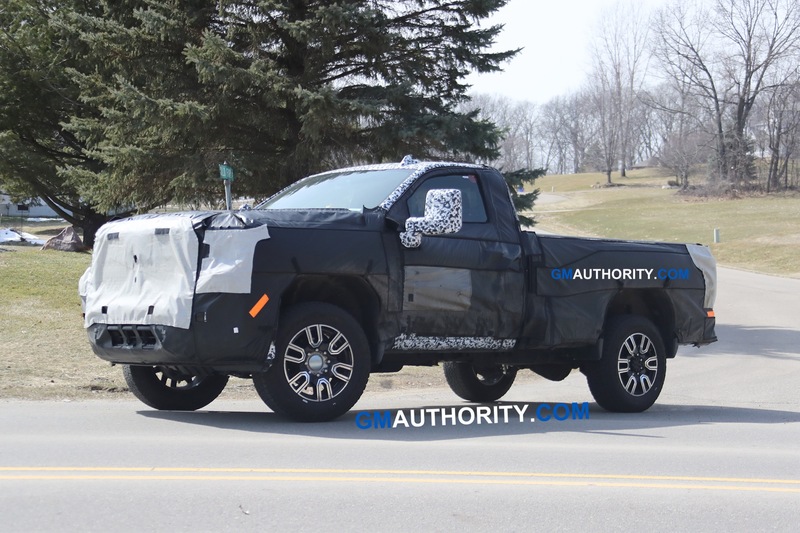 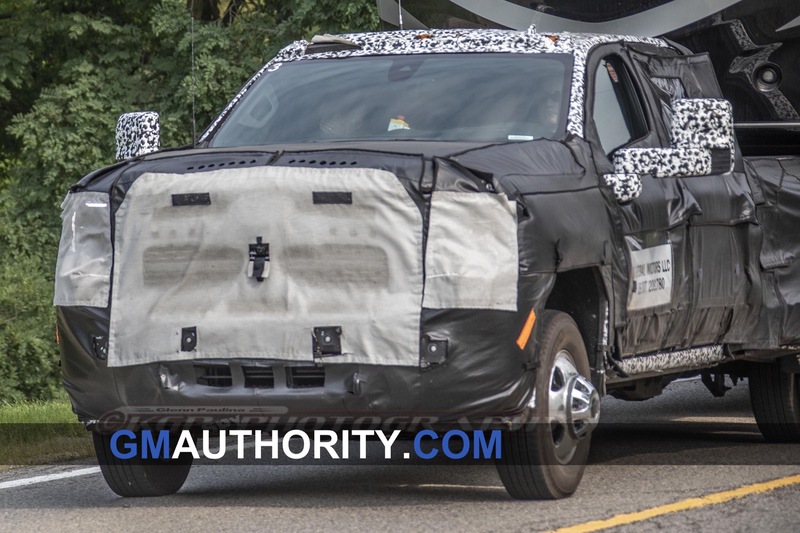 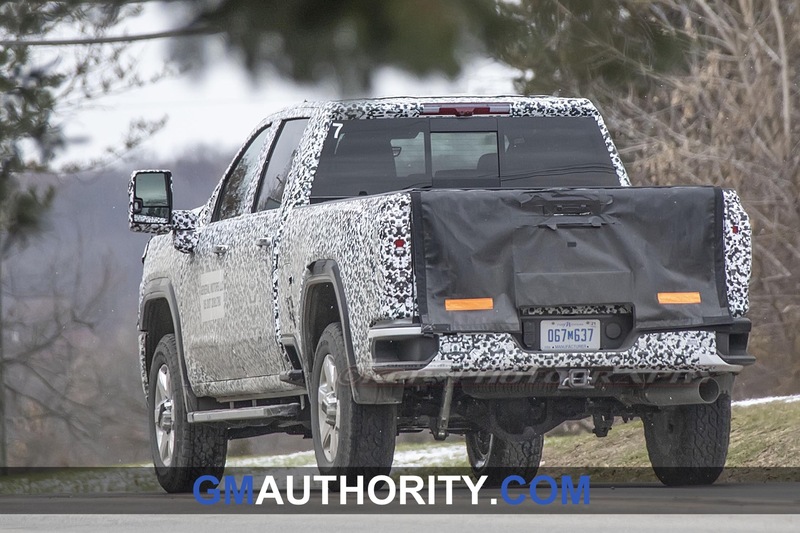 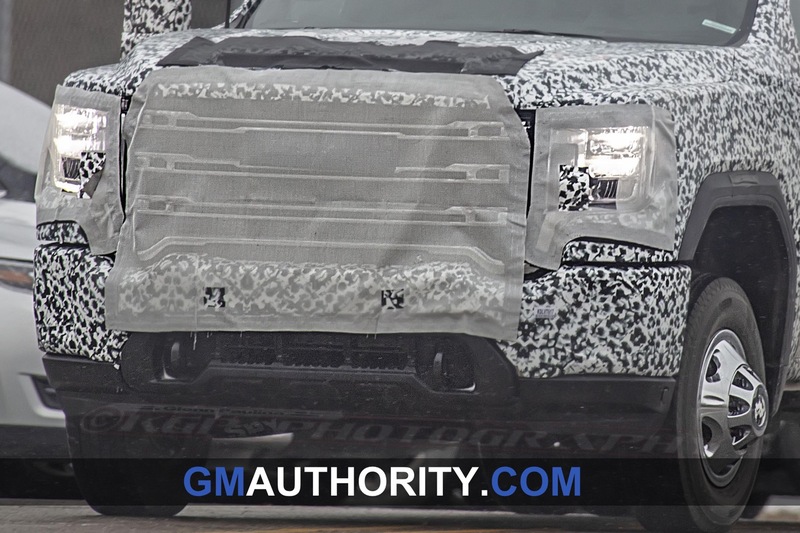 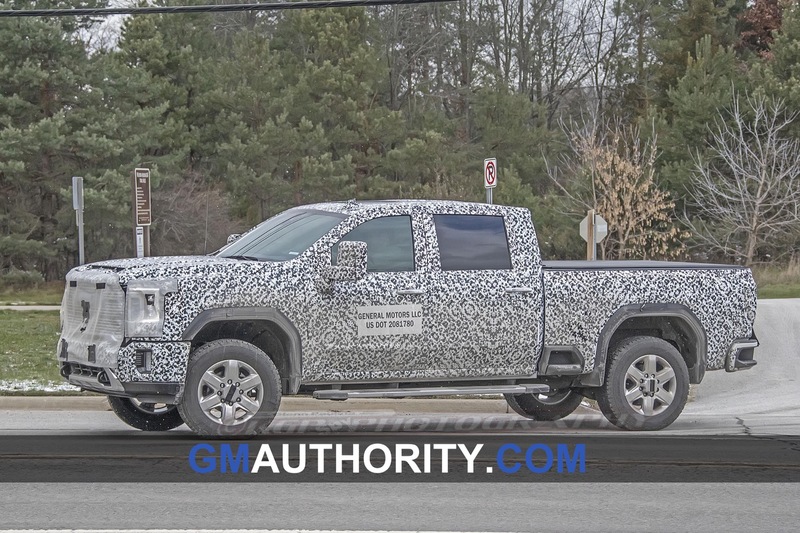 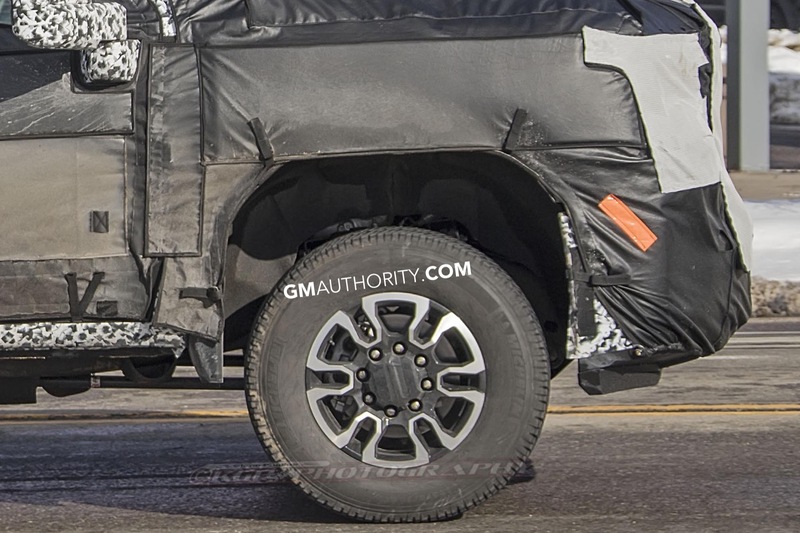 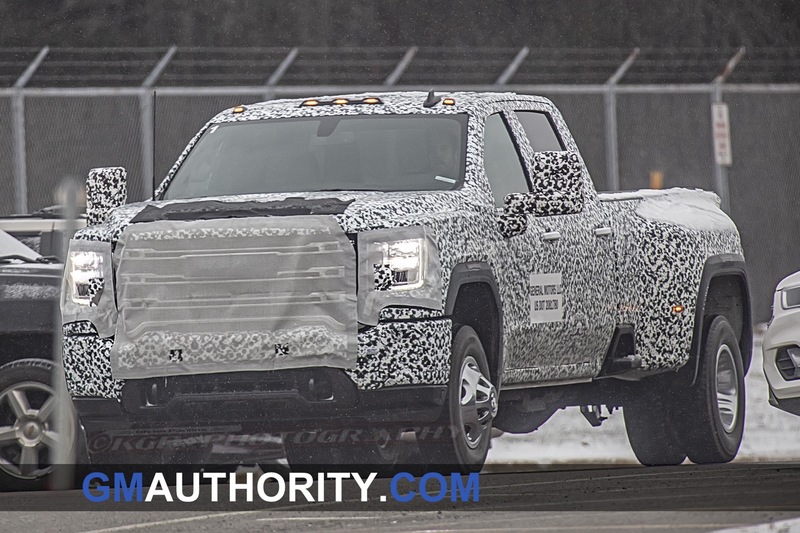 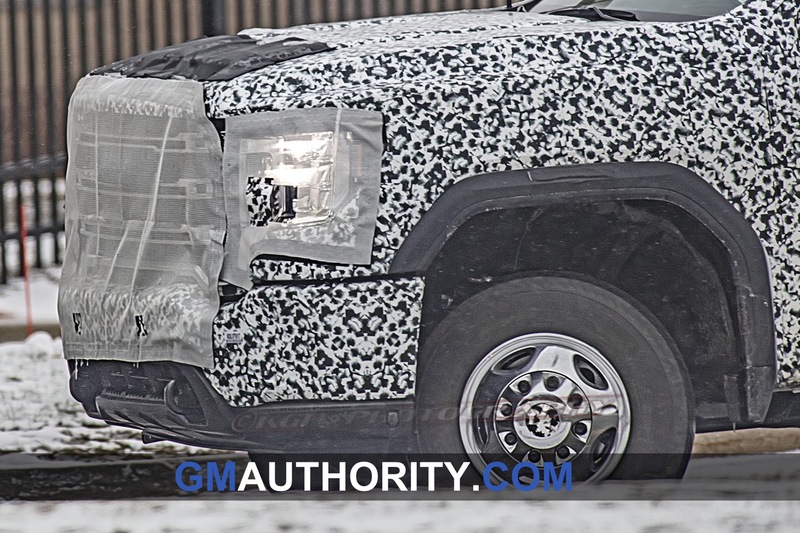 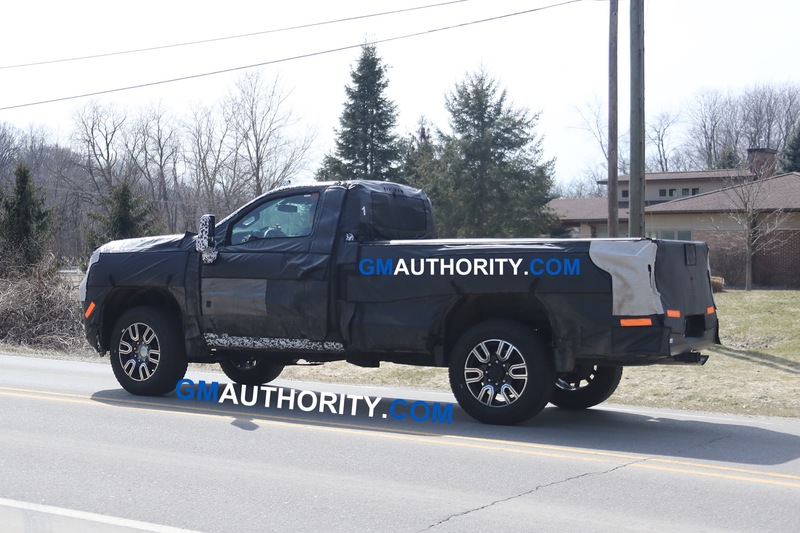 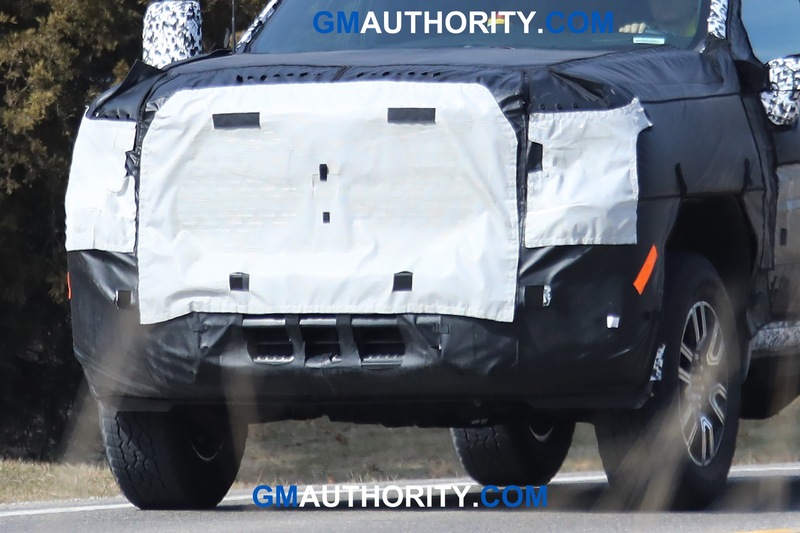 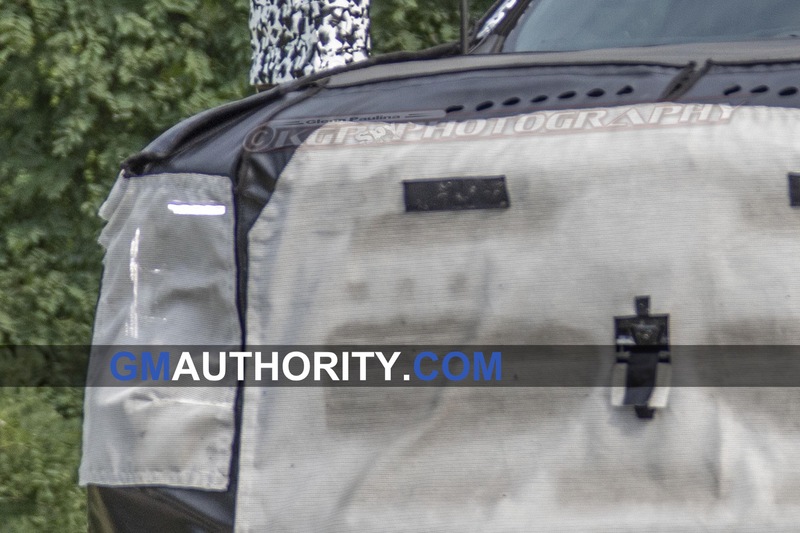 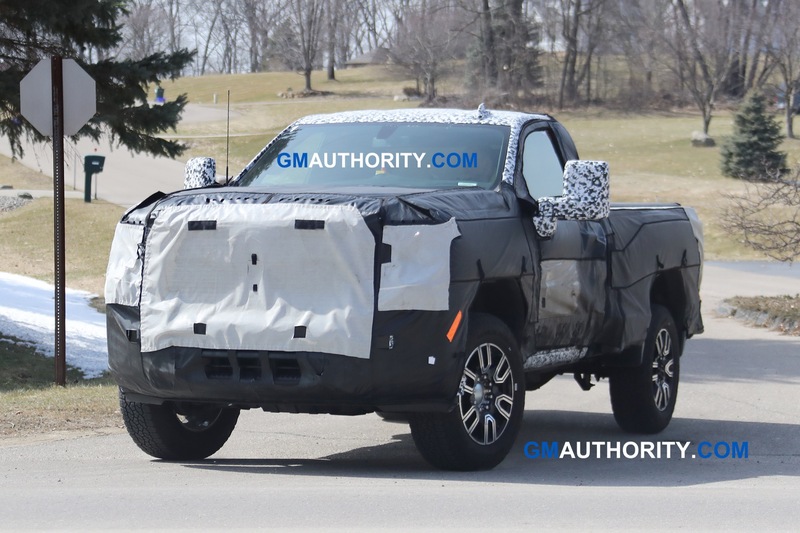 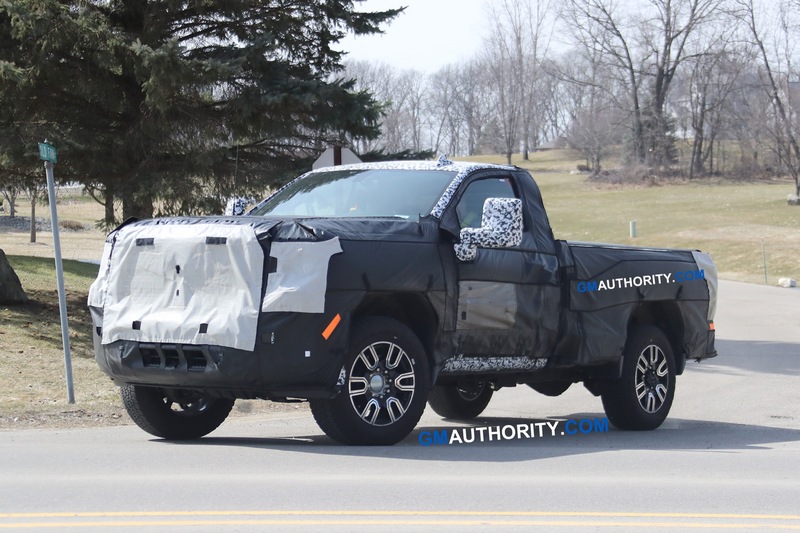 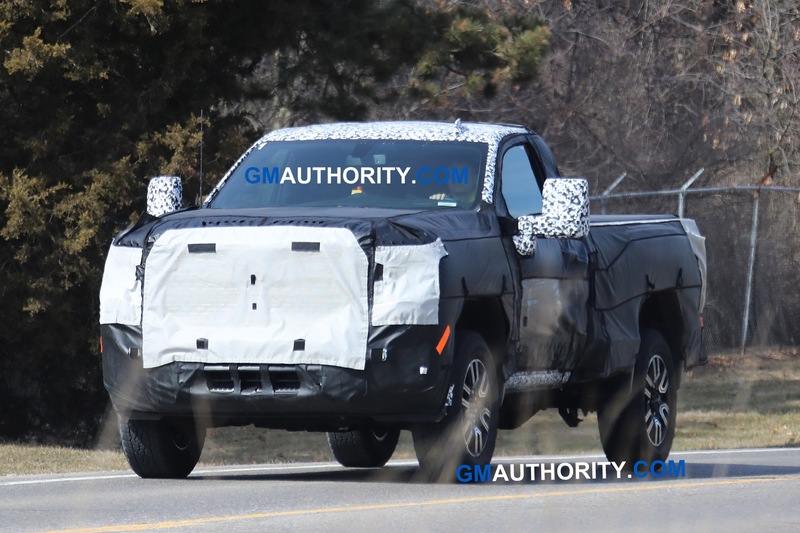 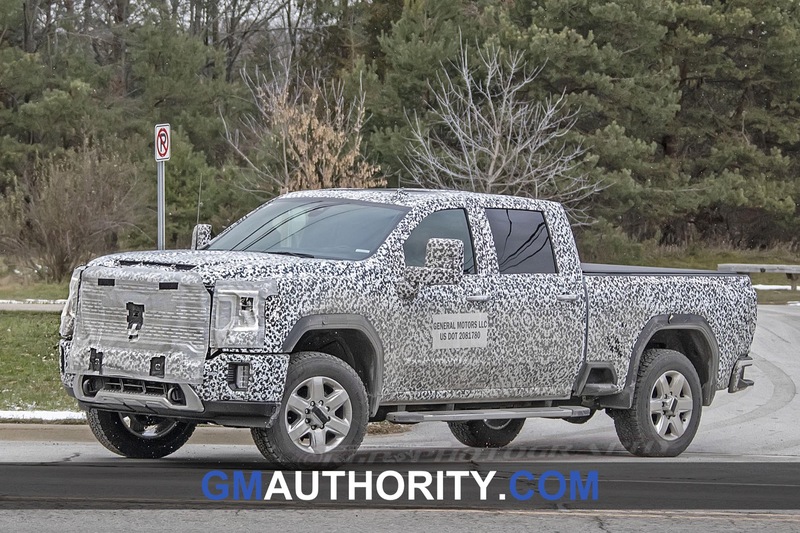 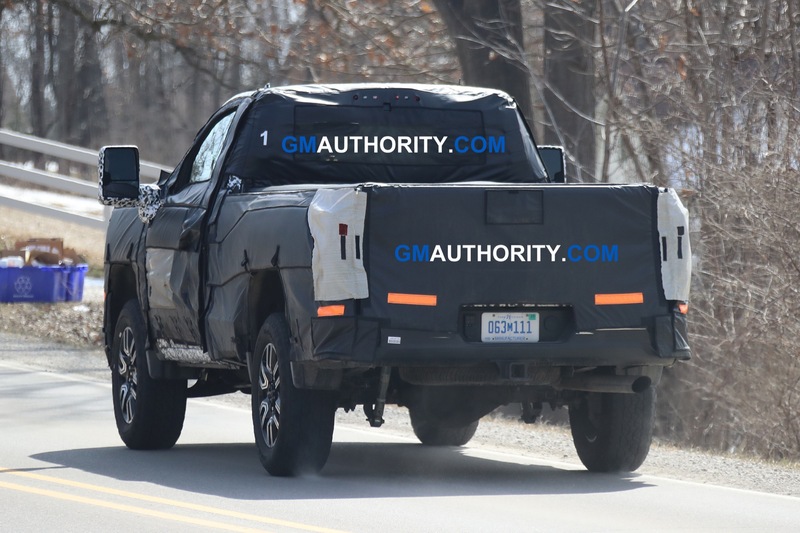 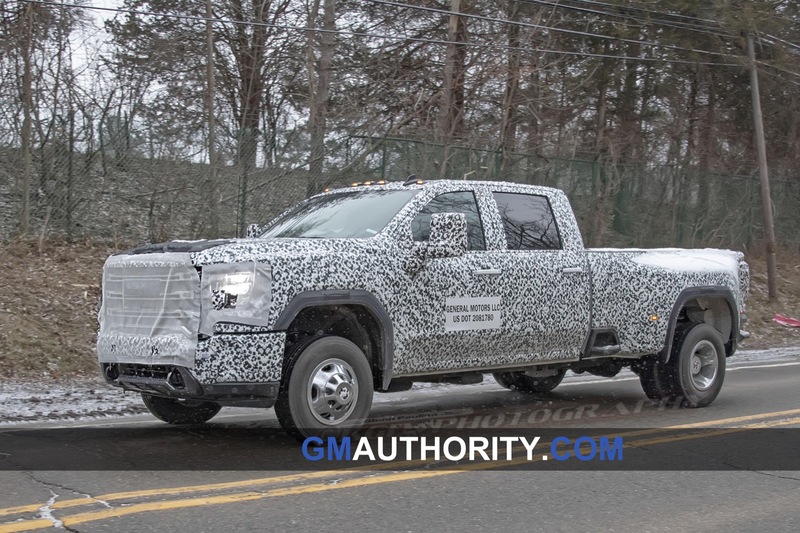 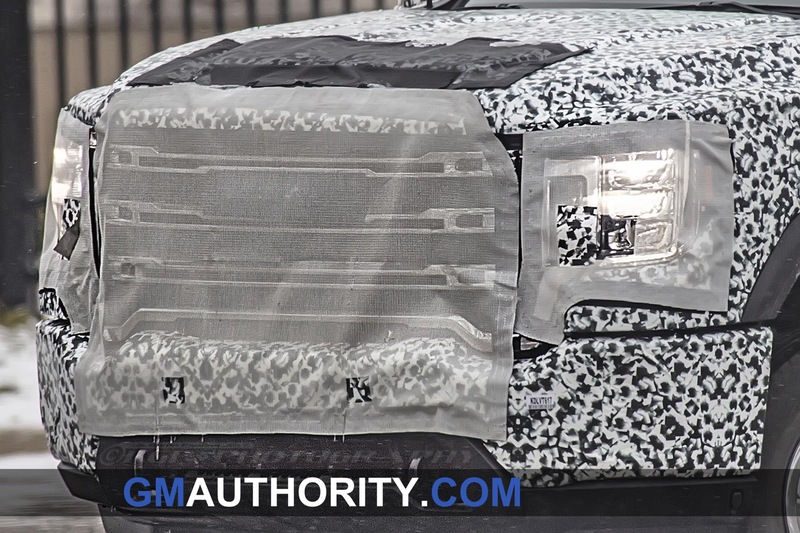 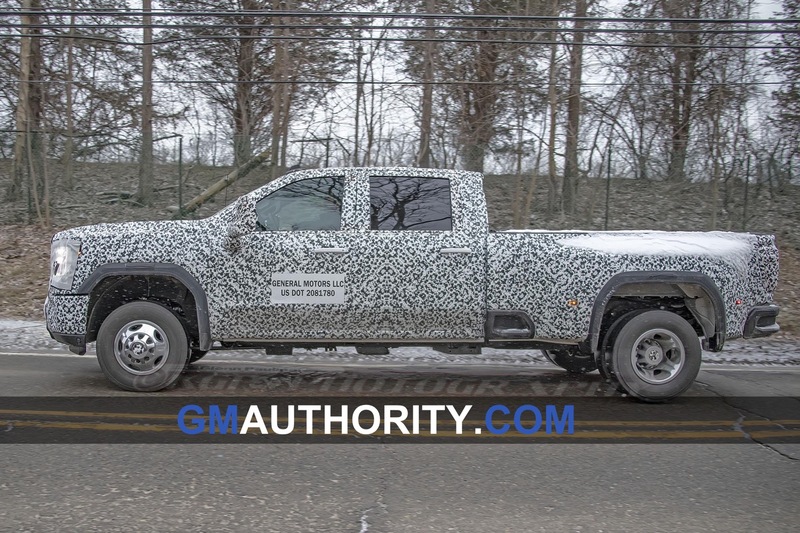 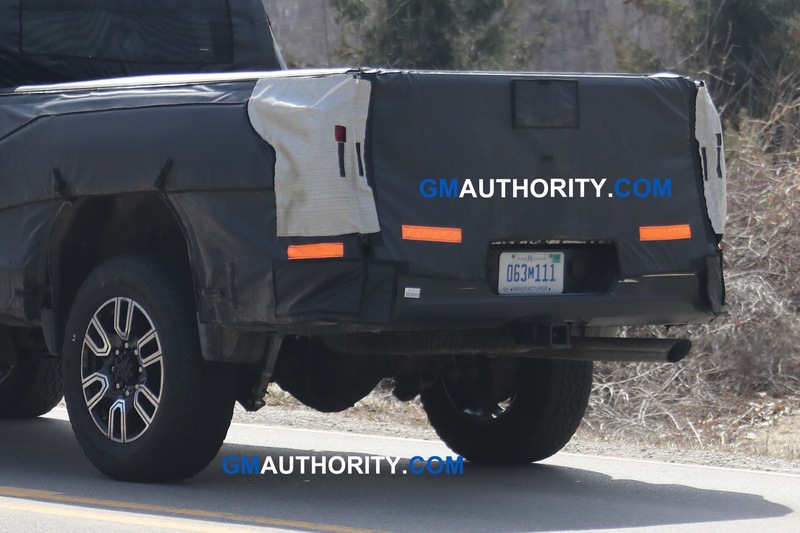 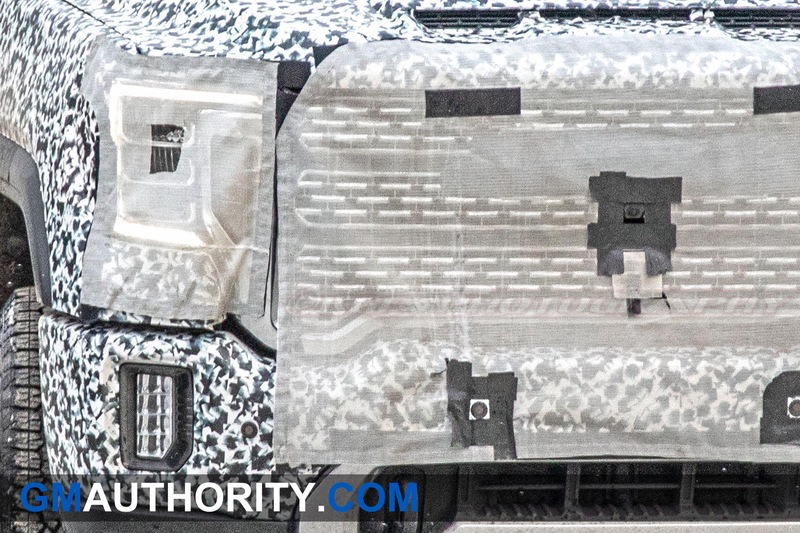 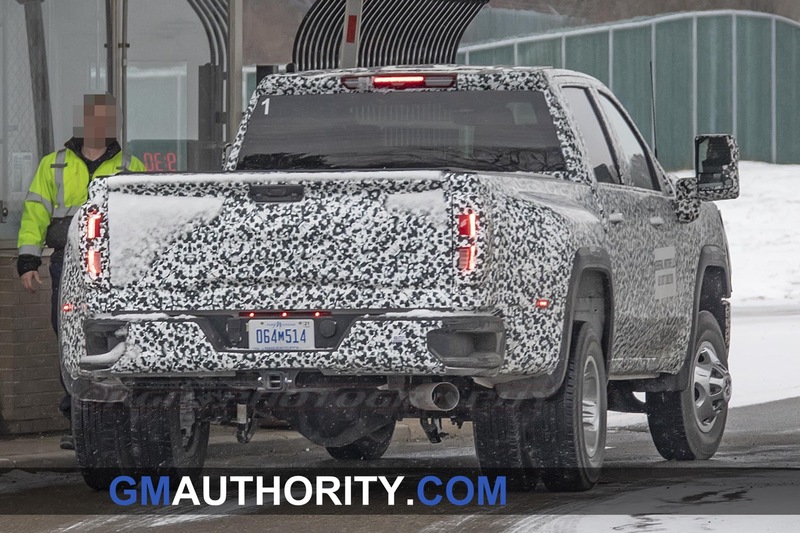 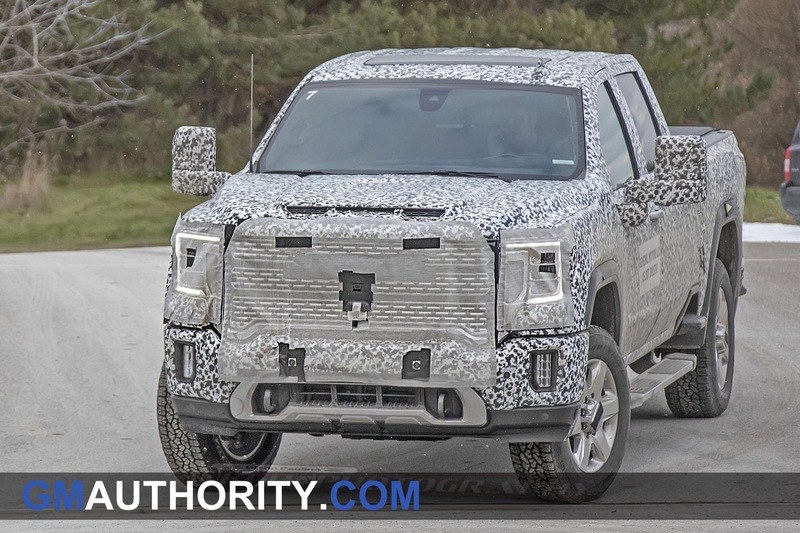 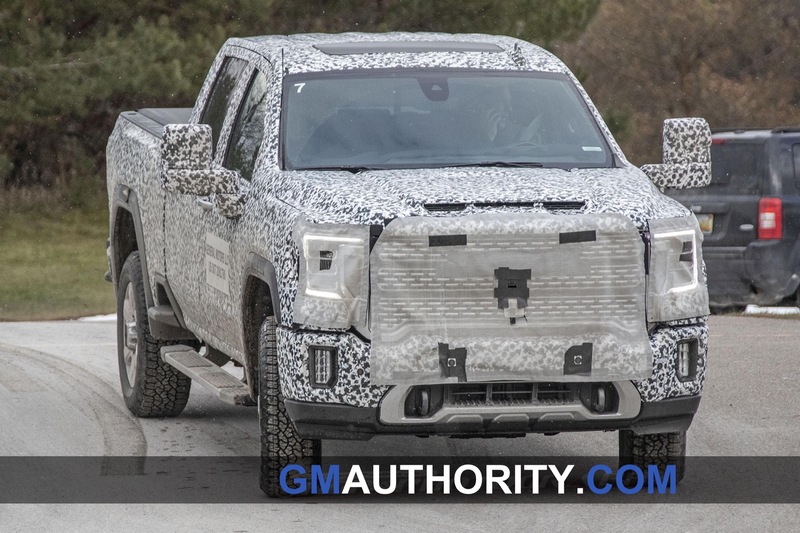 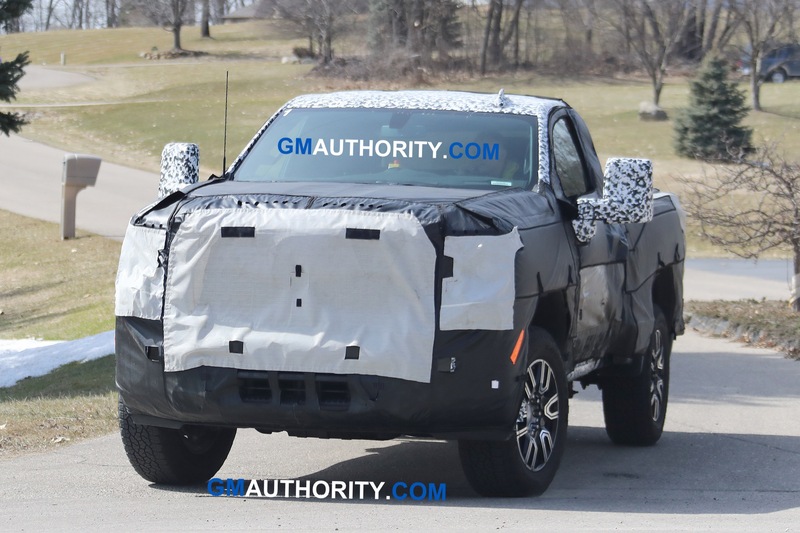 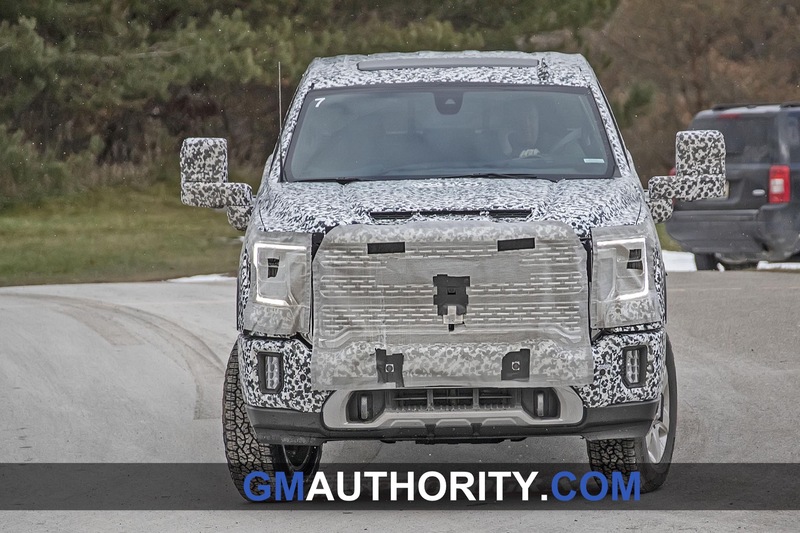 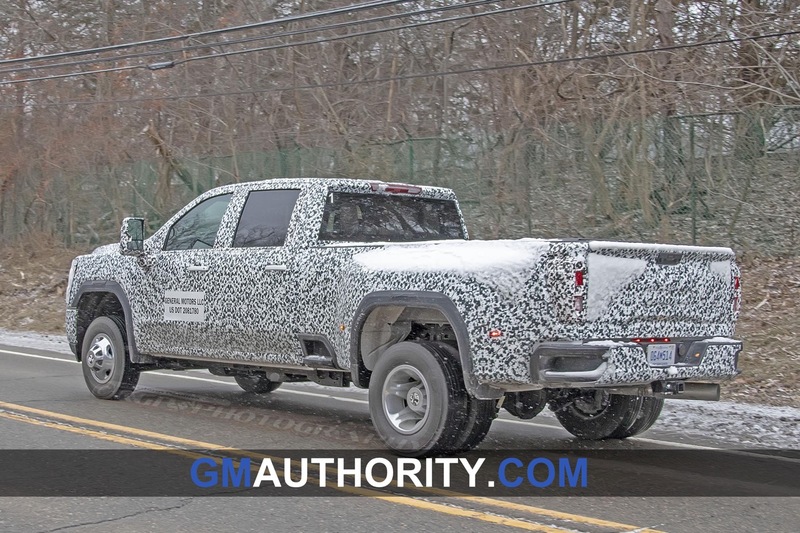 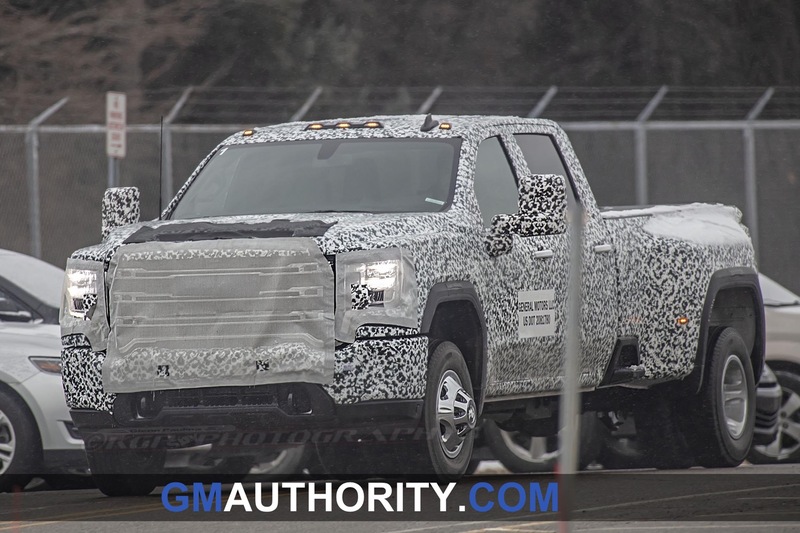 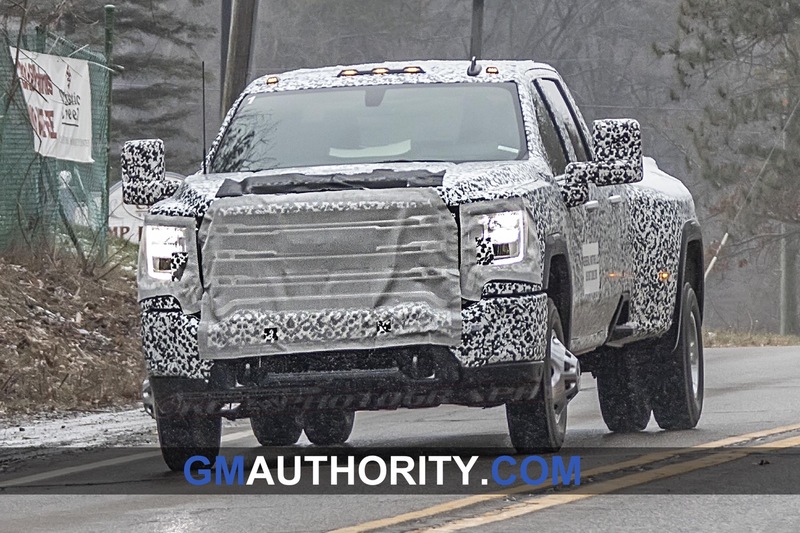 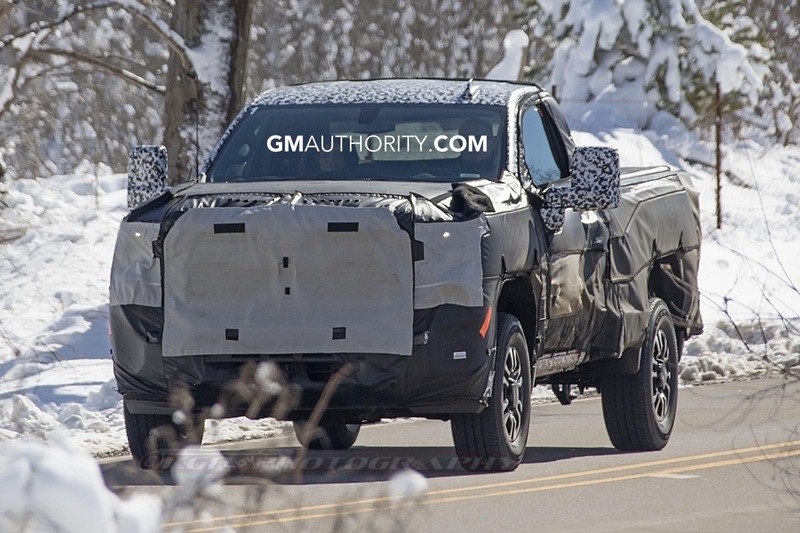 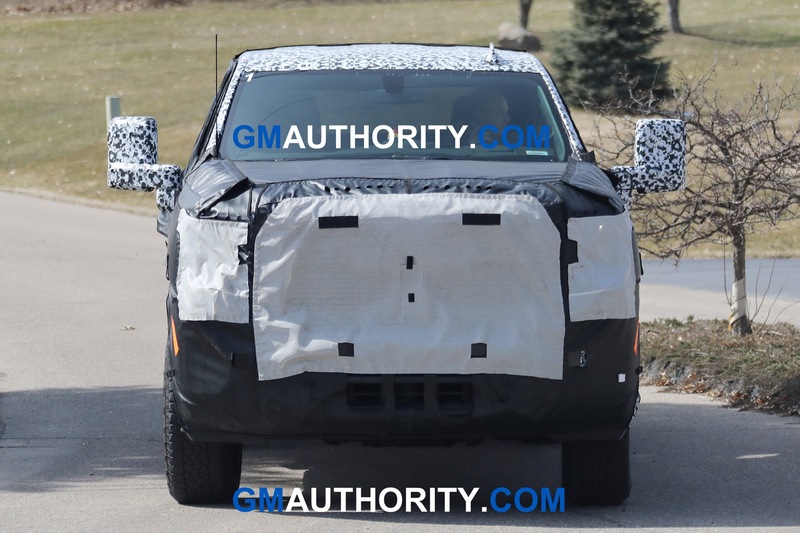 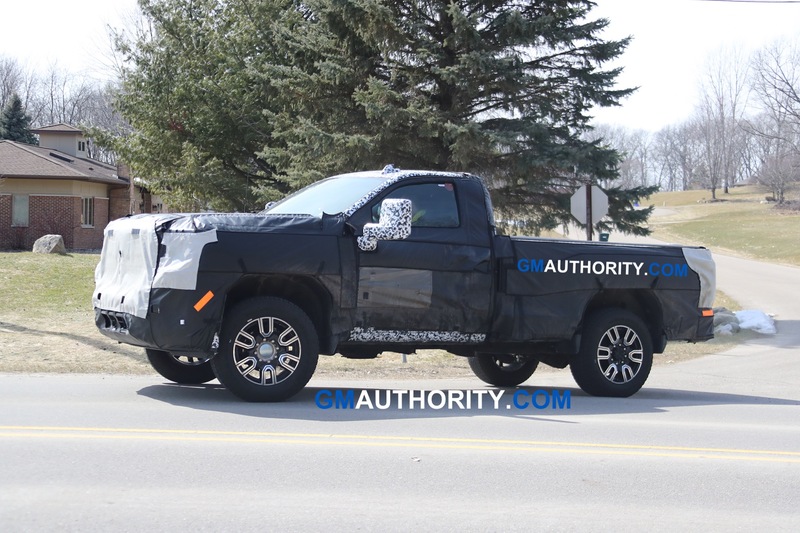 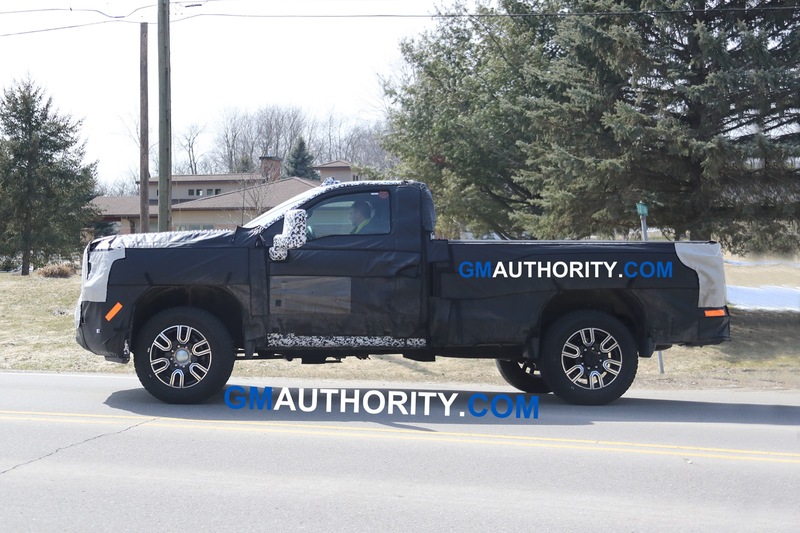 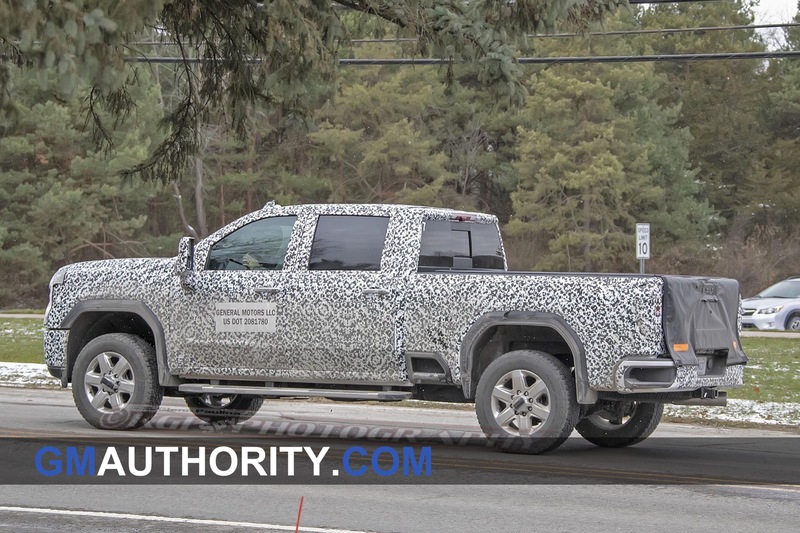 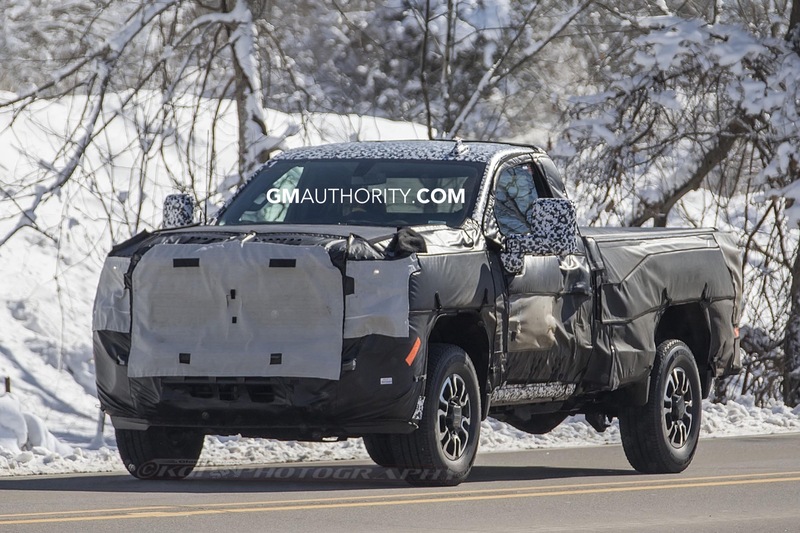 Behold the very first shots of the 2020 Sierra Heavy Duty in the Double Cab body style. 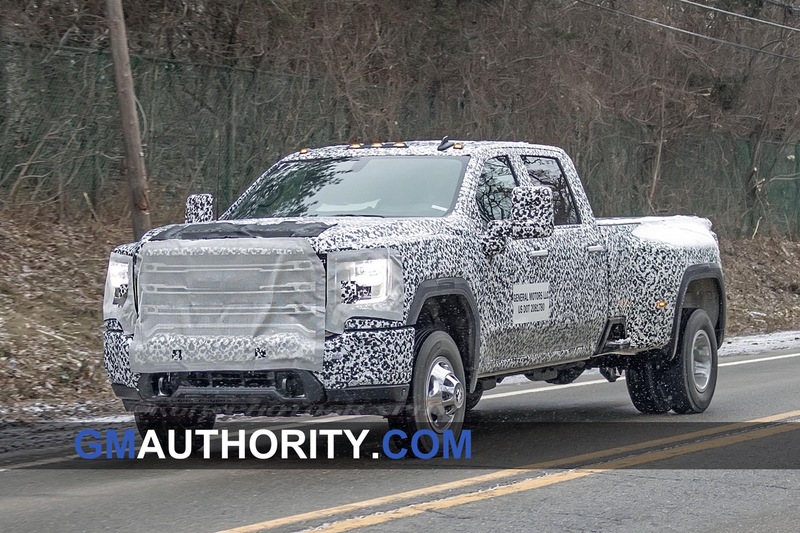 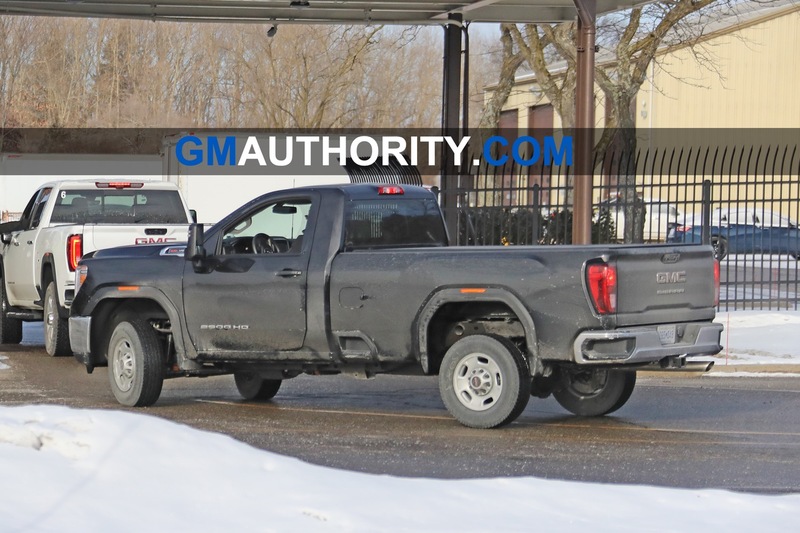 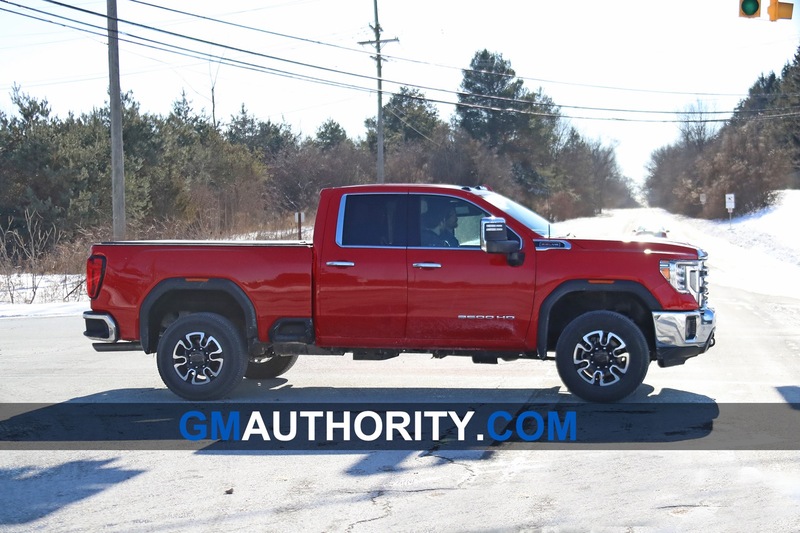 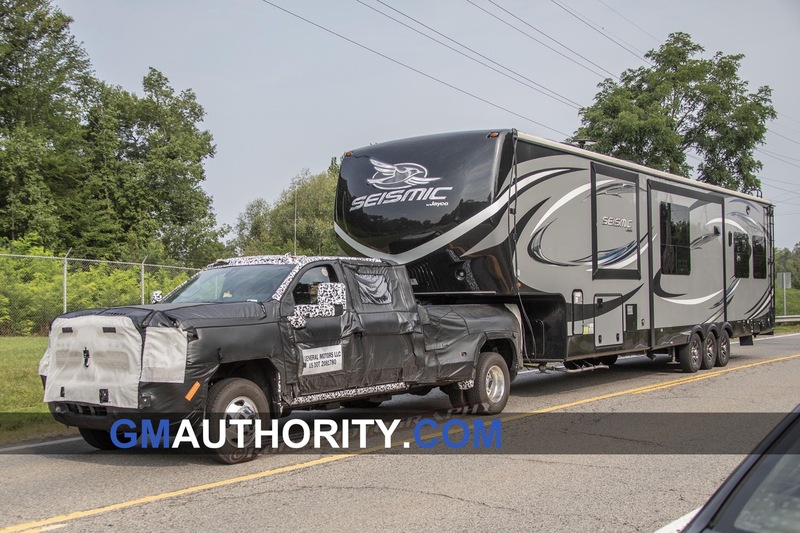 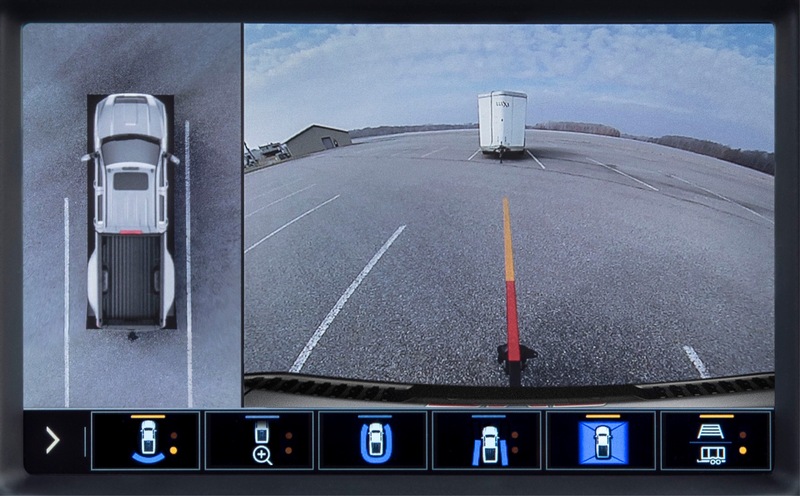 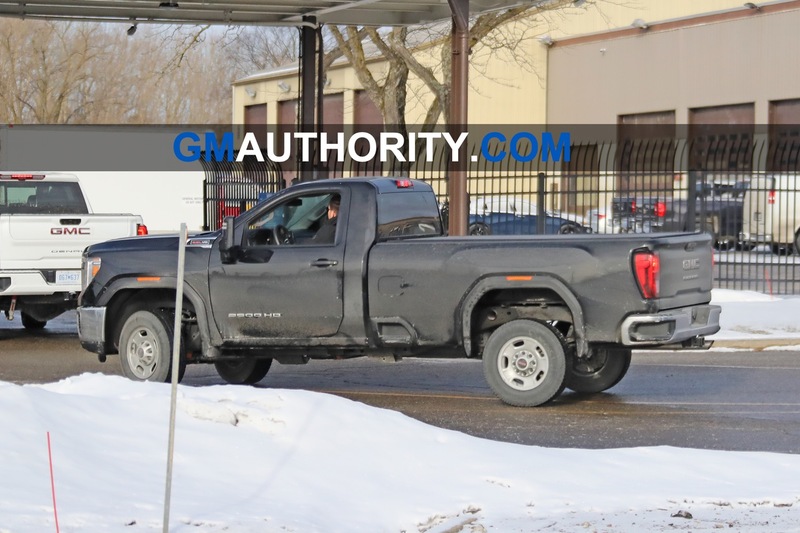 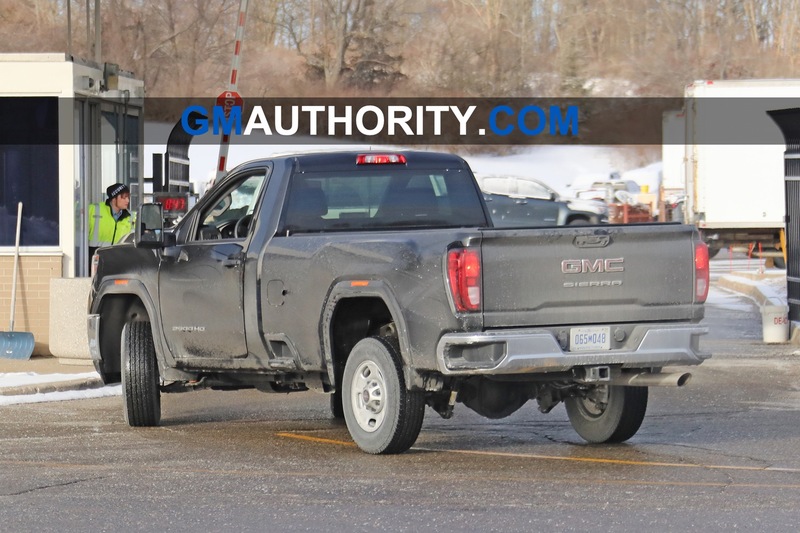 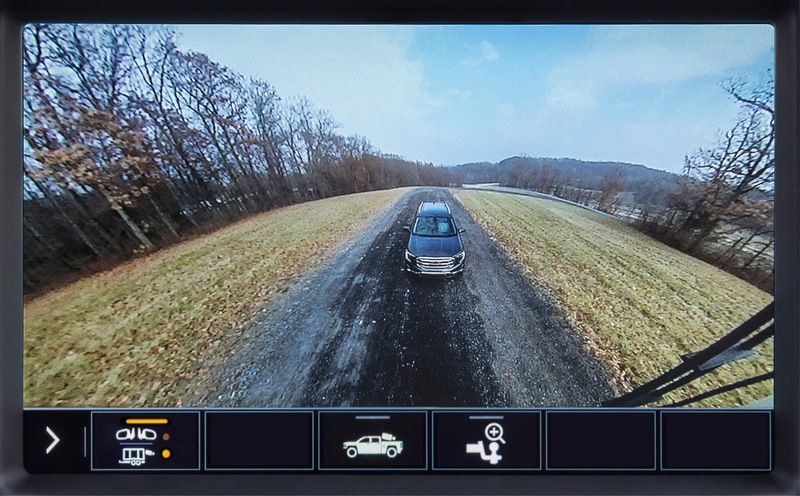 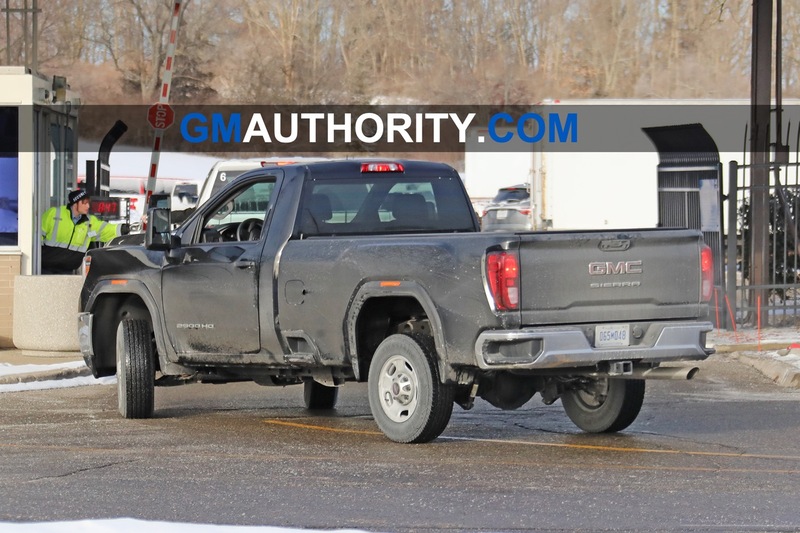 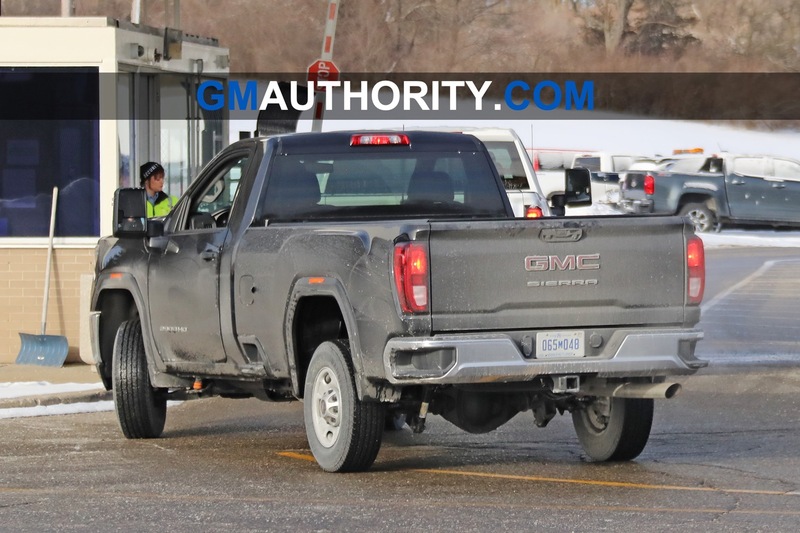 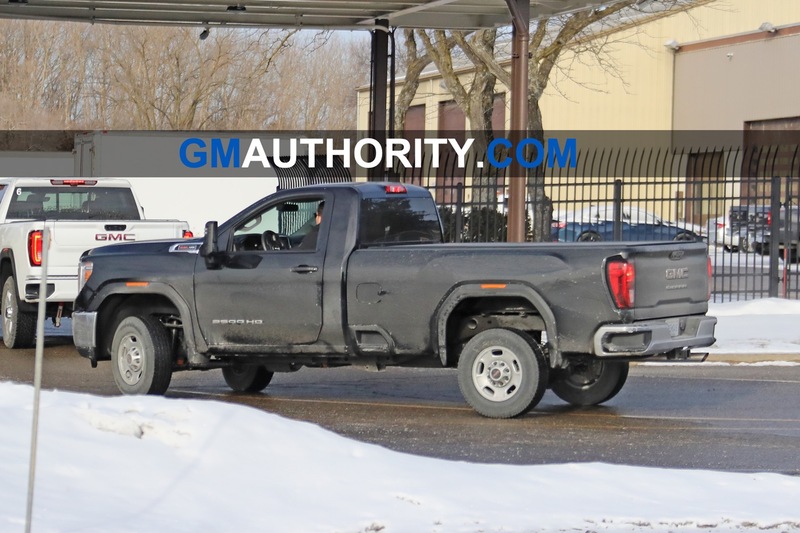 Caught undergoing testing by our eagle-eyed spy shooter, this marks the first time that we’ve seen an undisguised 2020 Sierra HD in Double Cab form, since GMC initially introduced the all-new Sierra HD exclusively in the Crew Cab body style. 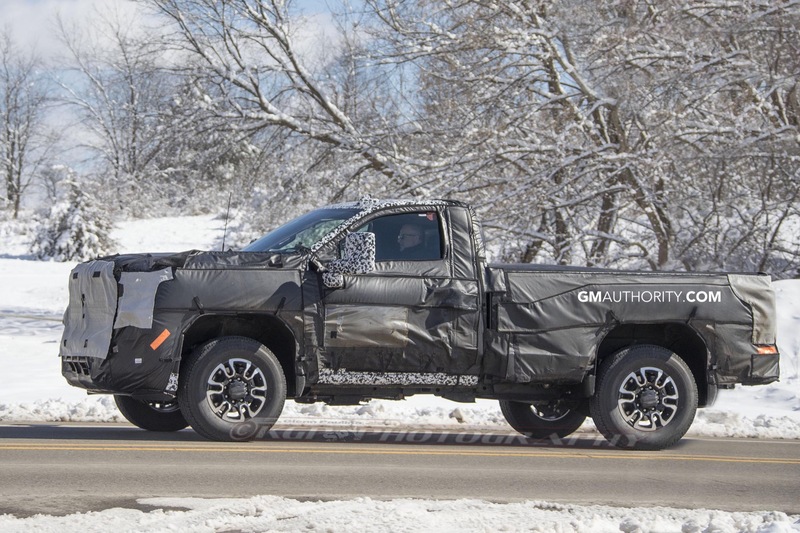 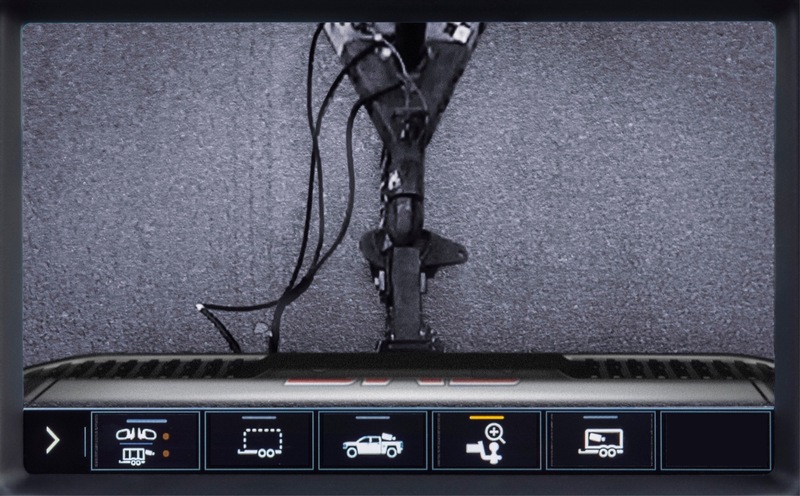 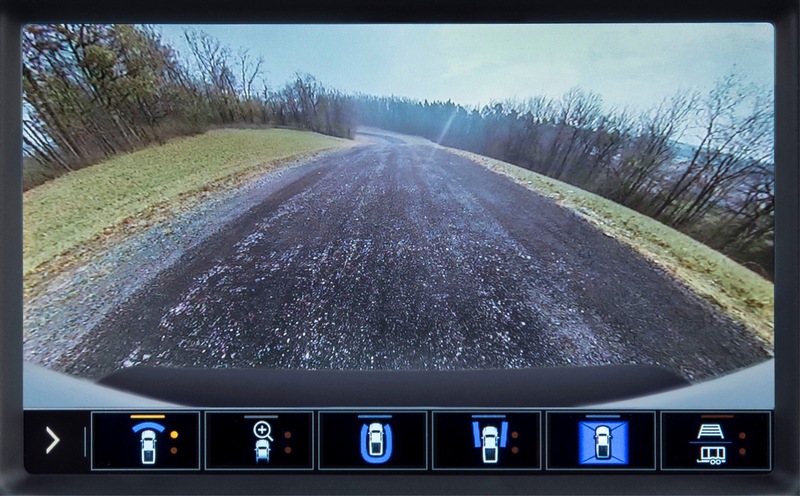 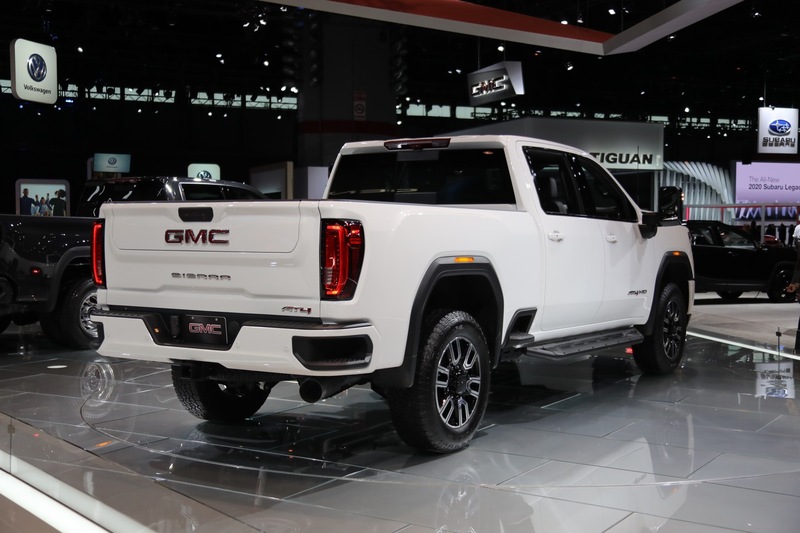 The tester is a Sierra 2500HD (per the badges on the doors) in SLT trim level (per the badges on the tailgate) with the all-new 6.6L V8 gasoline engine under the hood (per the badges on the front fender/hood). 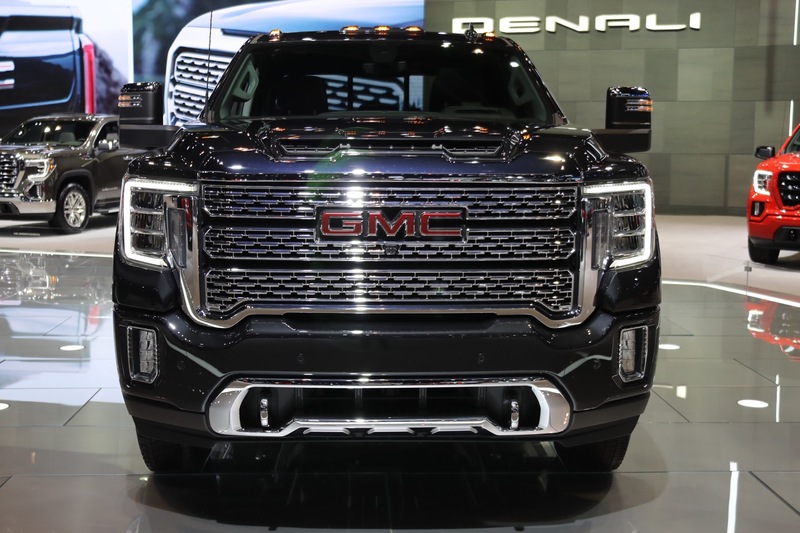 Details on the new V8 engine are currently few and far between, since GMC announced the existence of the new engine but did not provide any other details like power, torque, configuration, layout, or any other details. 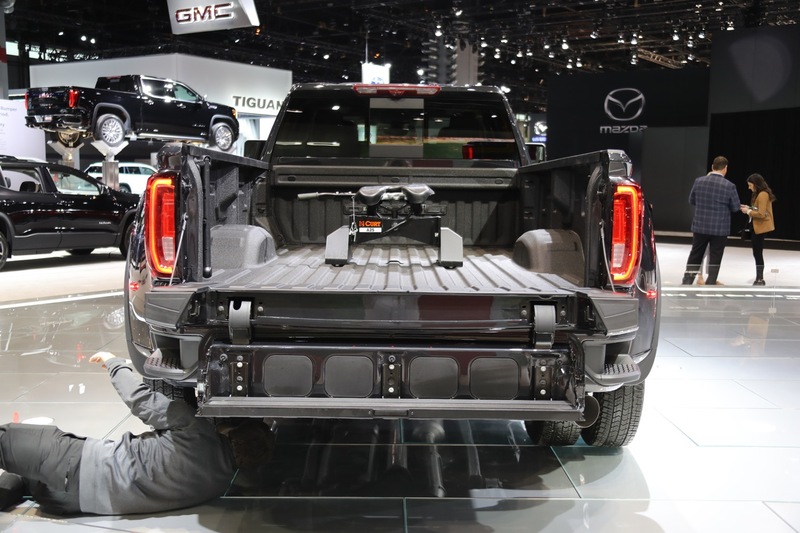 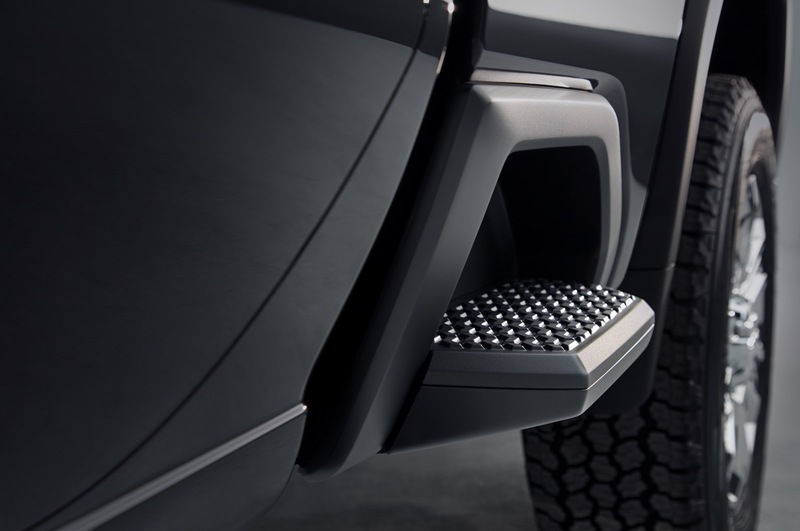 Seeing the Double Cab layout also confirms our suspicion about the location of the new BedStep: no matter the cab layout, it will always be placed at the fore-most portion of the bed. 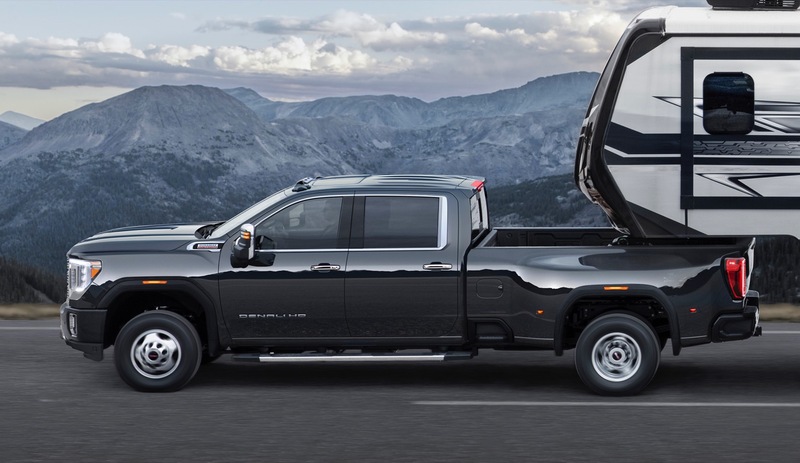 As for the cab itself: the rear doors are notably smaller on the Double Cab than on the Crew Cab, and that’s the whole point. 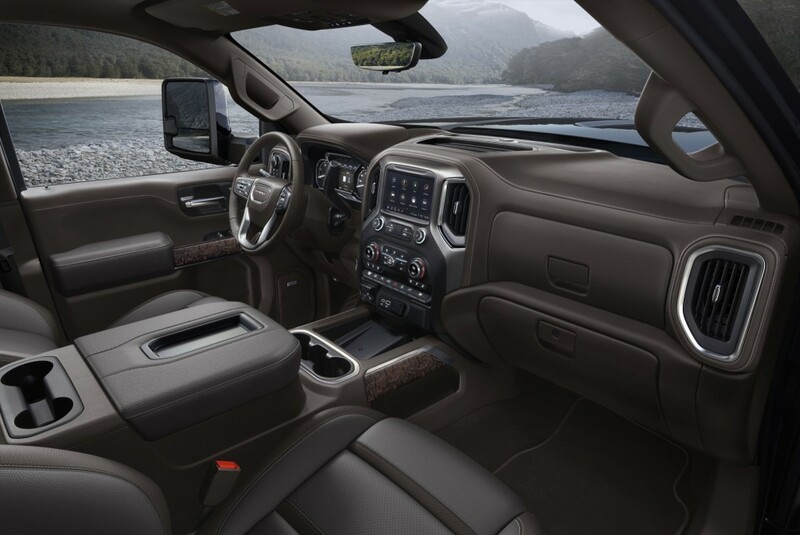 But the Double Cab still seems to be rather spacious in a way that it can seat four occupants comfortably. 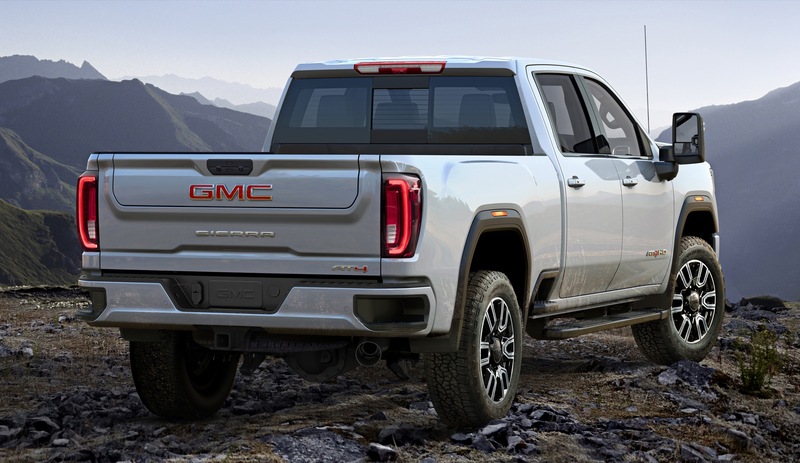 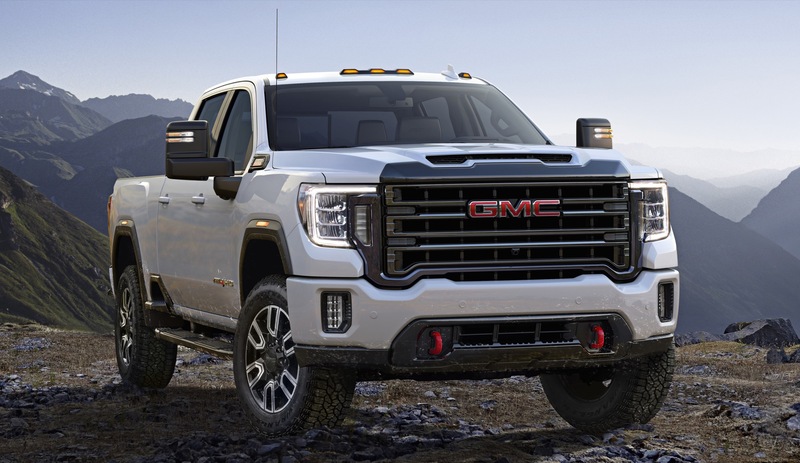 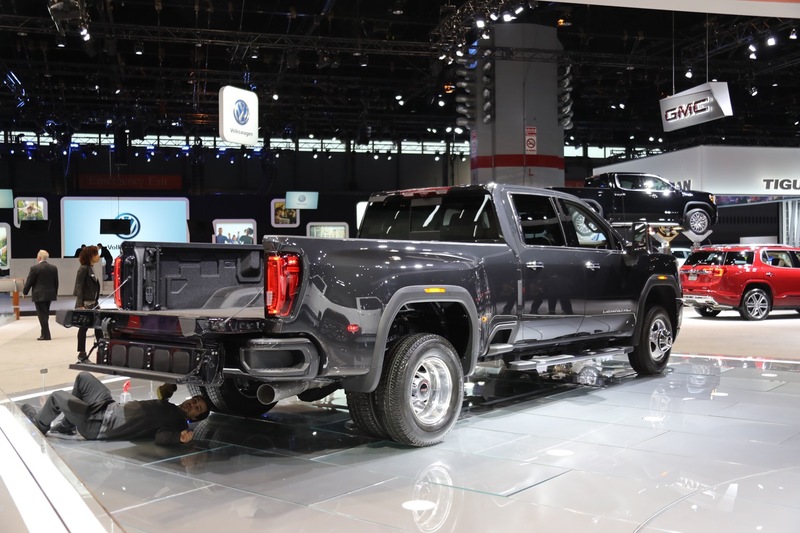 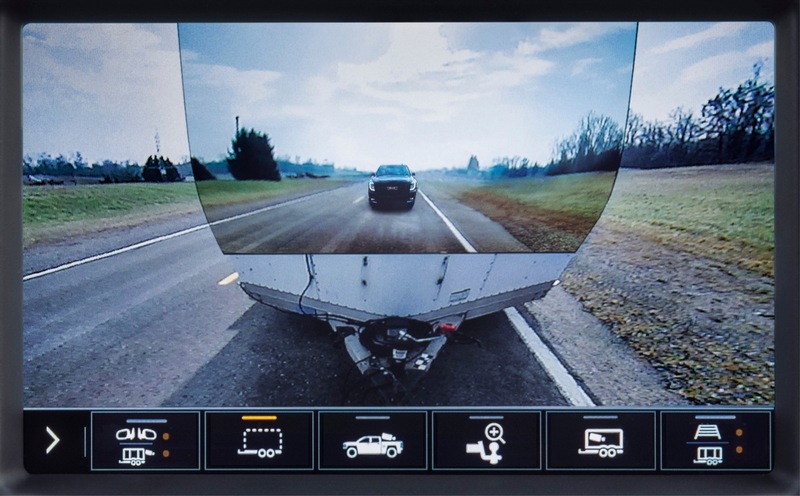 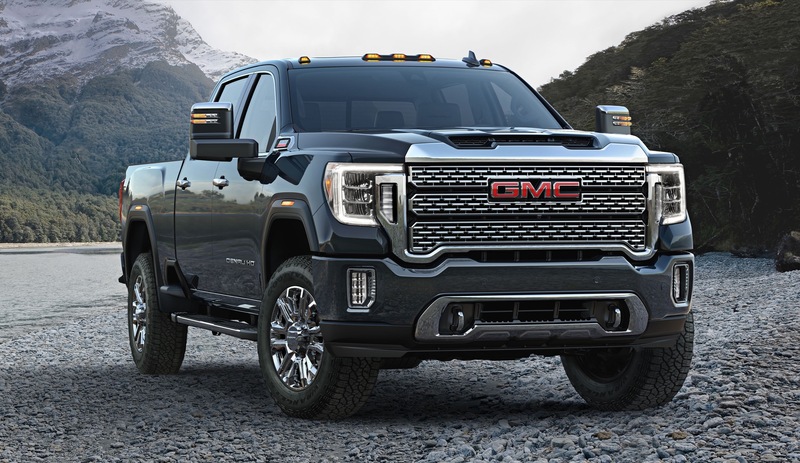 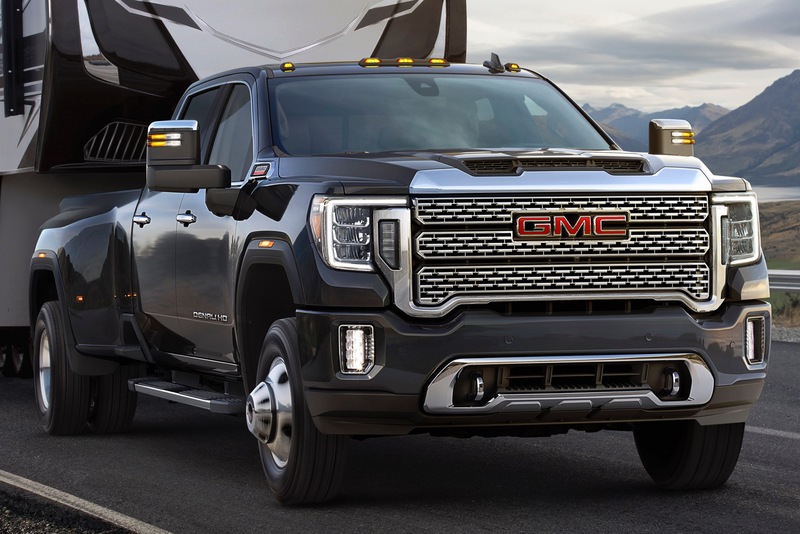 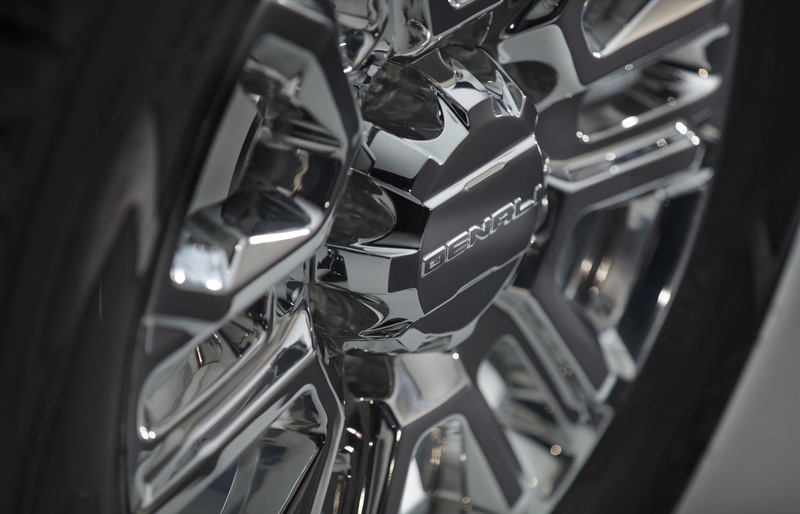 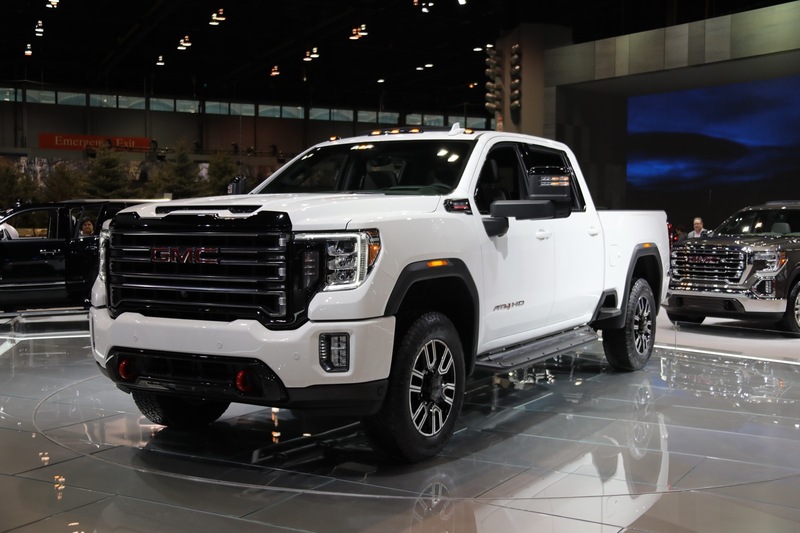 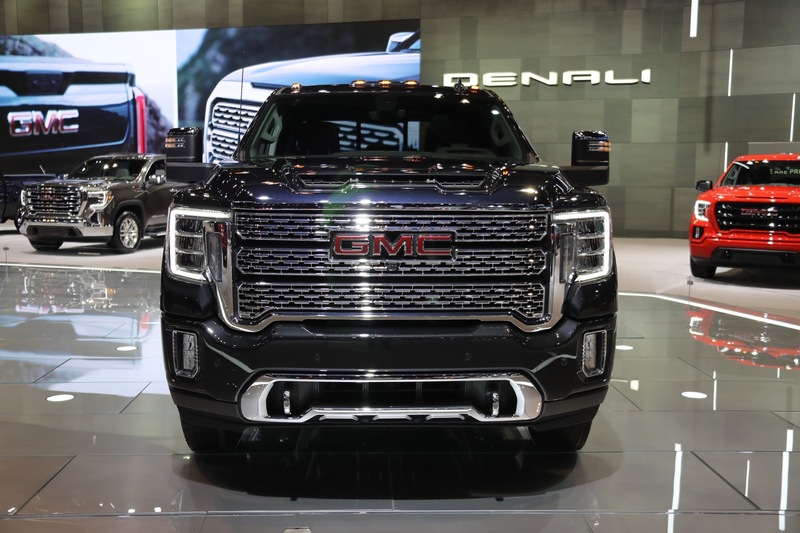 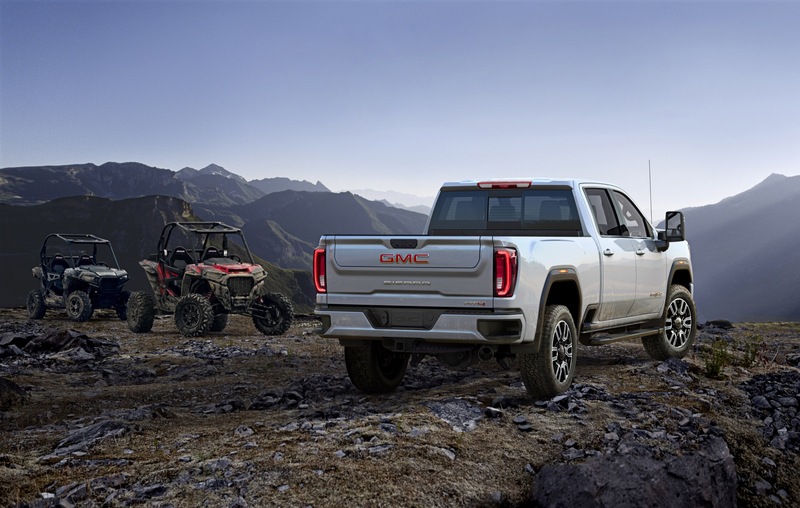 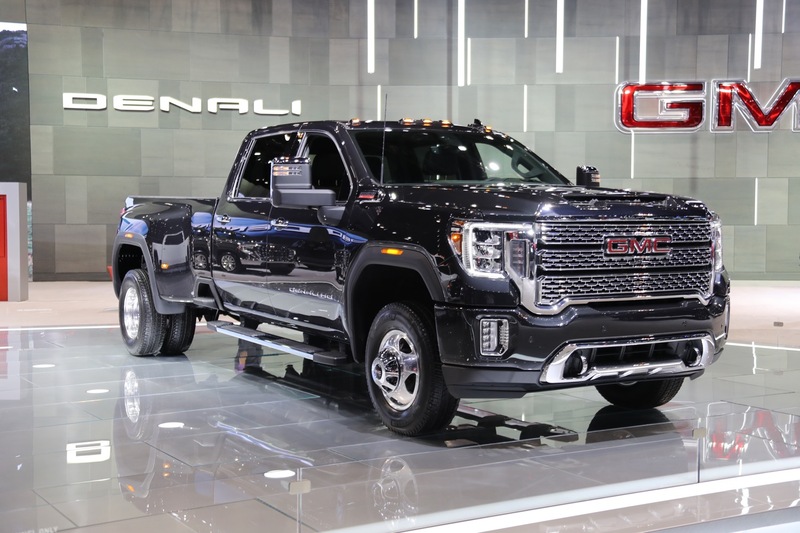 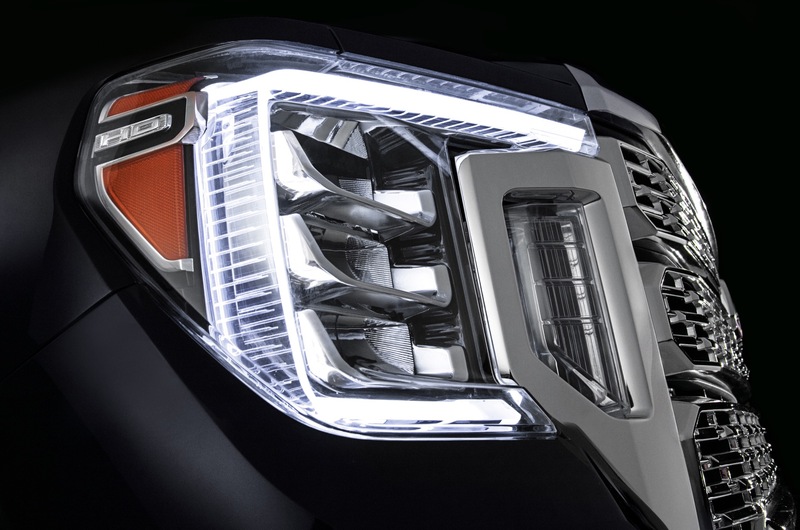 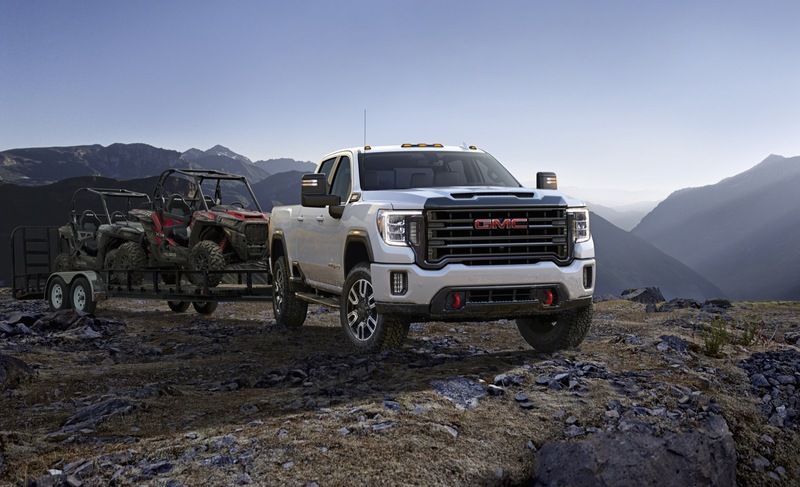 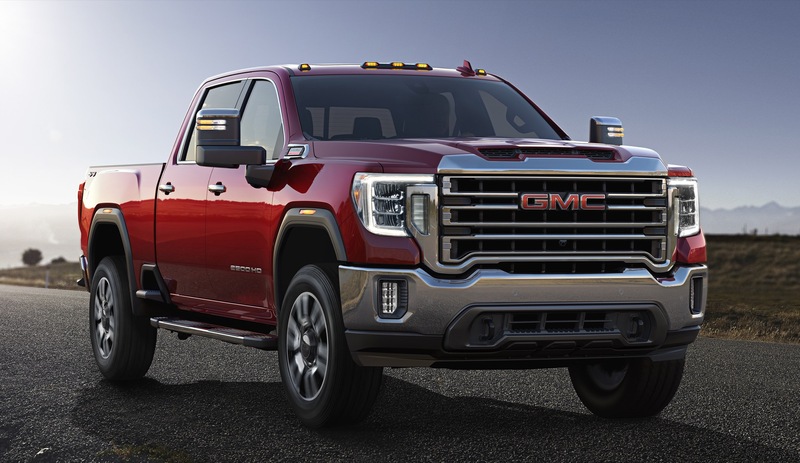 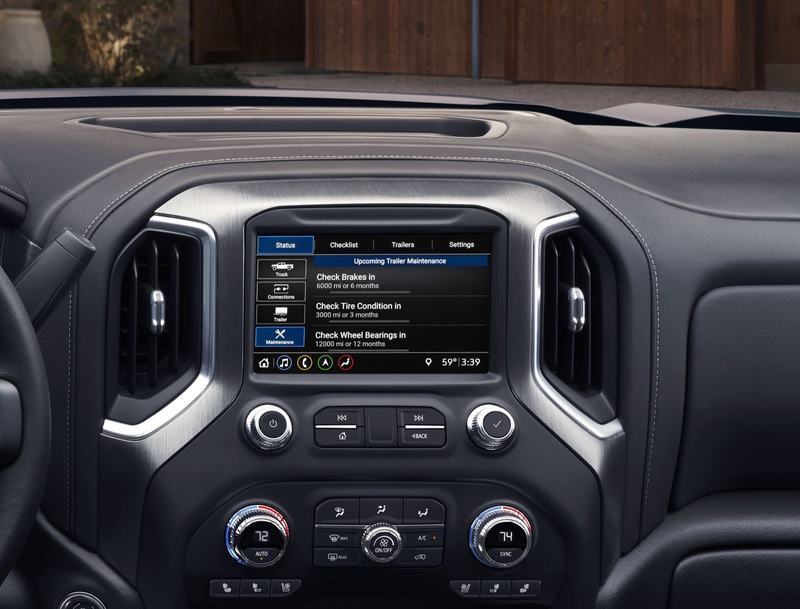 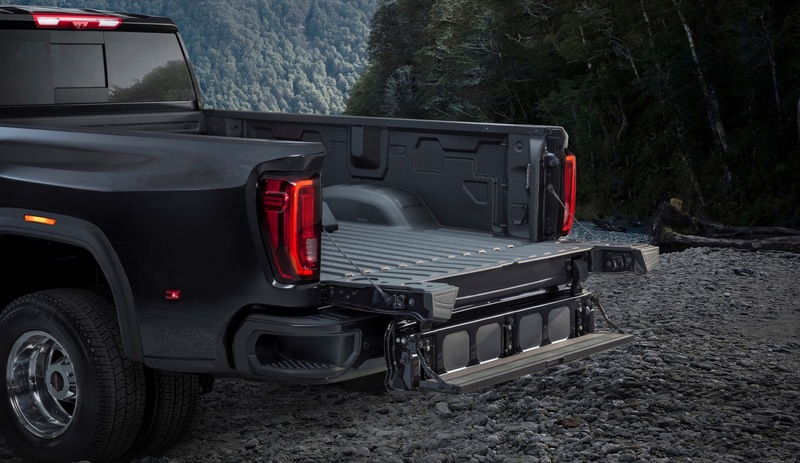 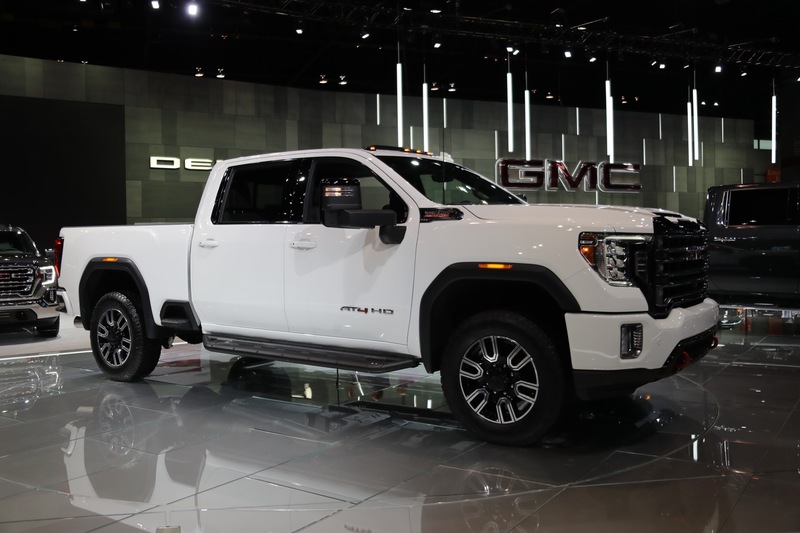 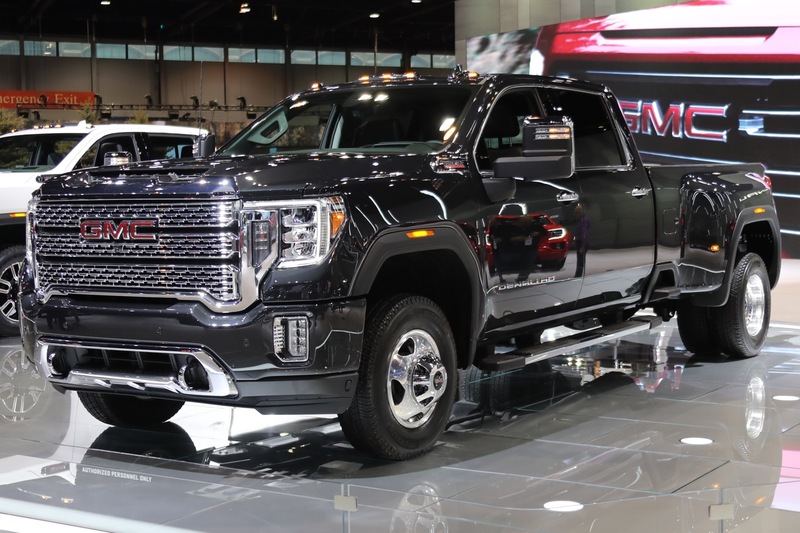 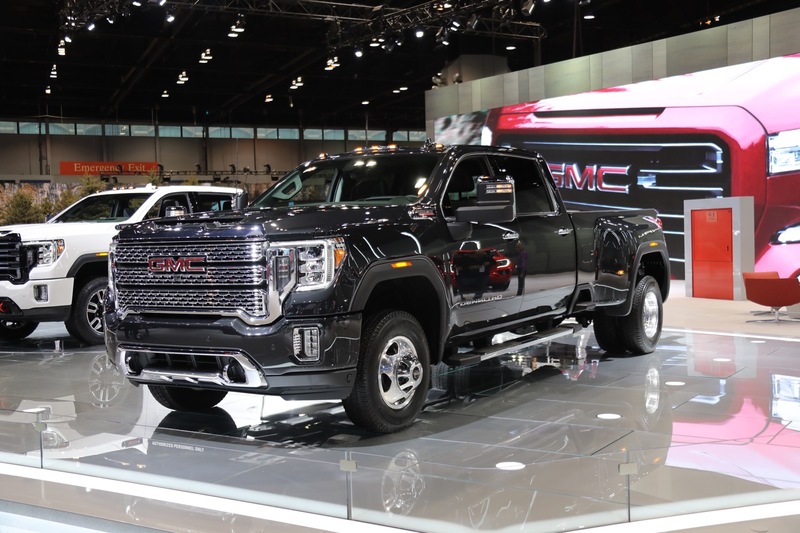 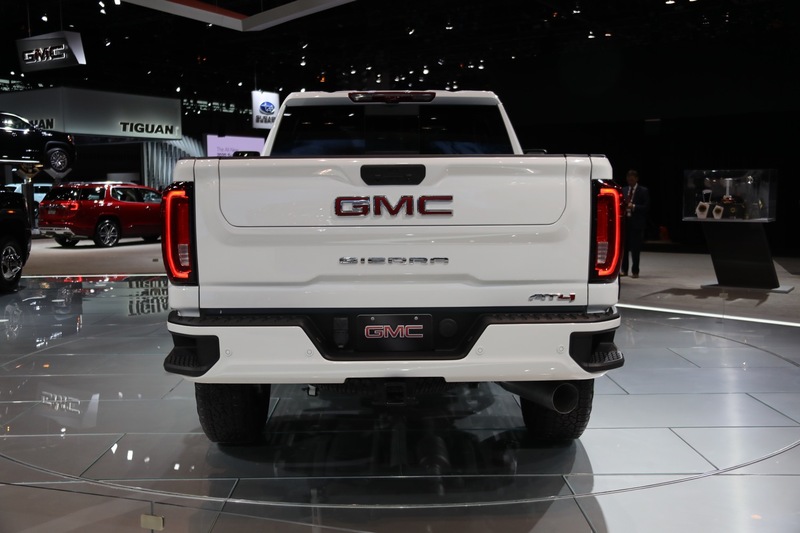 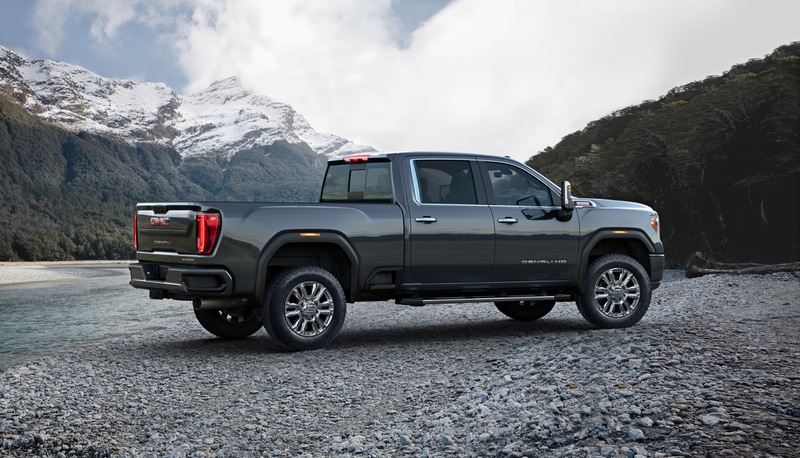 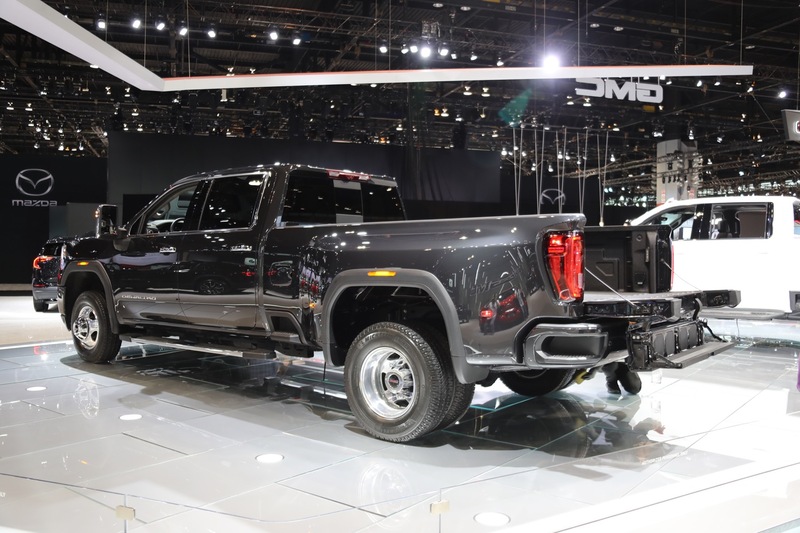 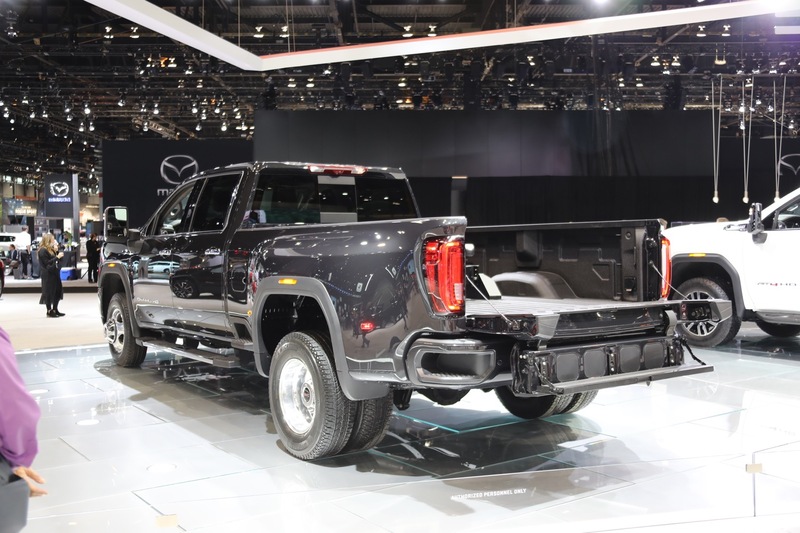 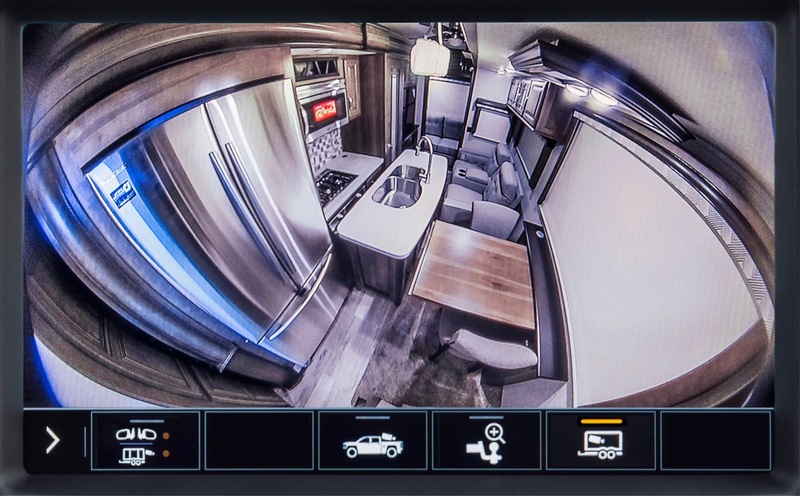 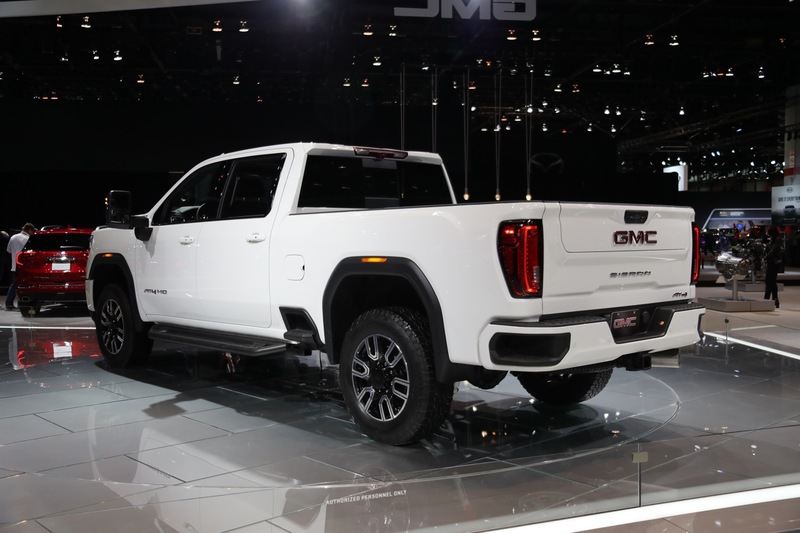 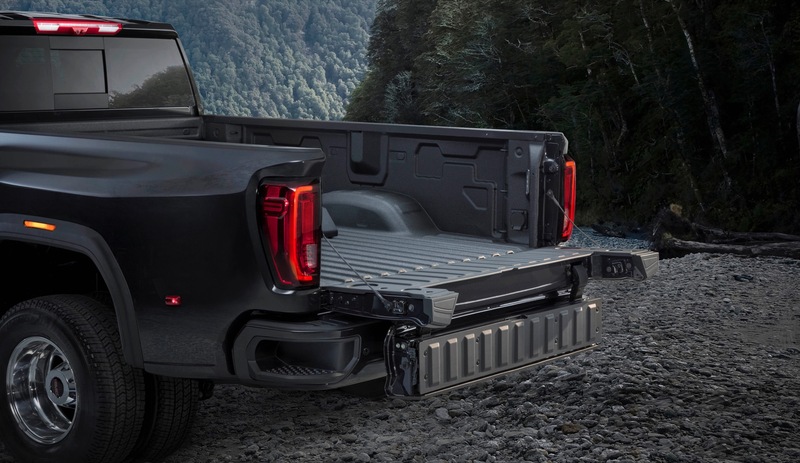 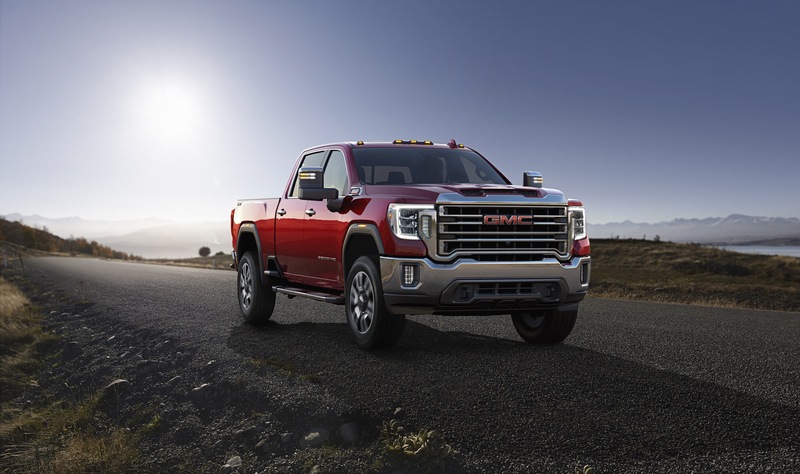 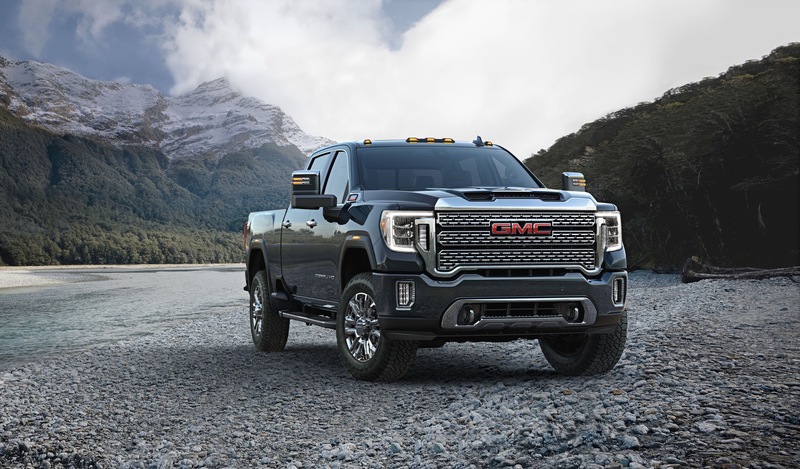 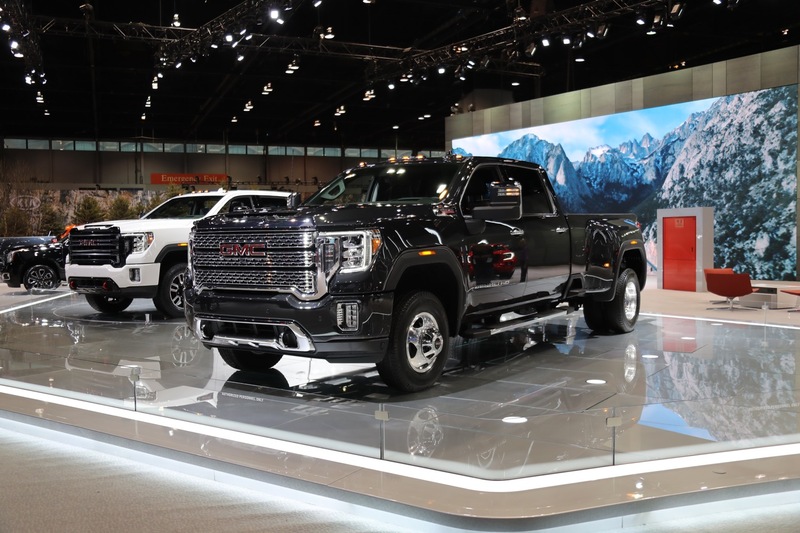 No specifications or dimensional information about the all-new 2020 Sierra HD is currently available, as GMC will release it closer to the truck’s launch date. 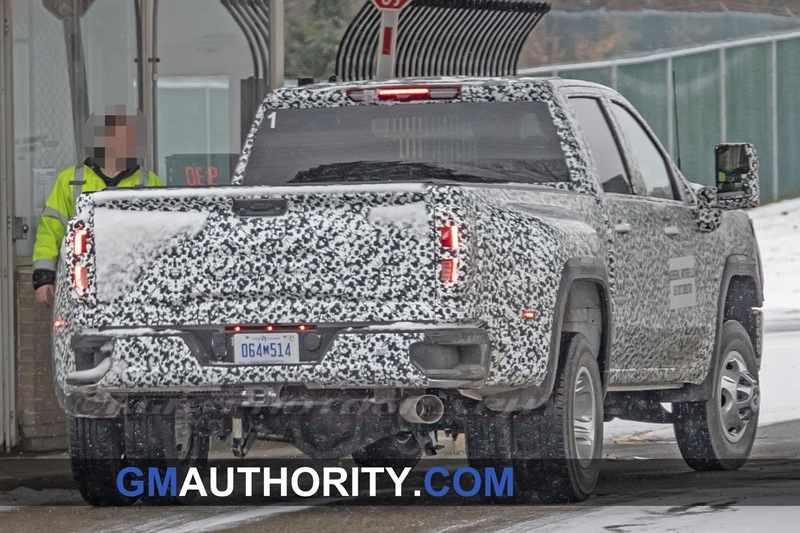 We want details on the 6.6 Gasser! 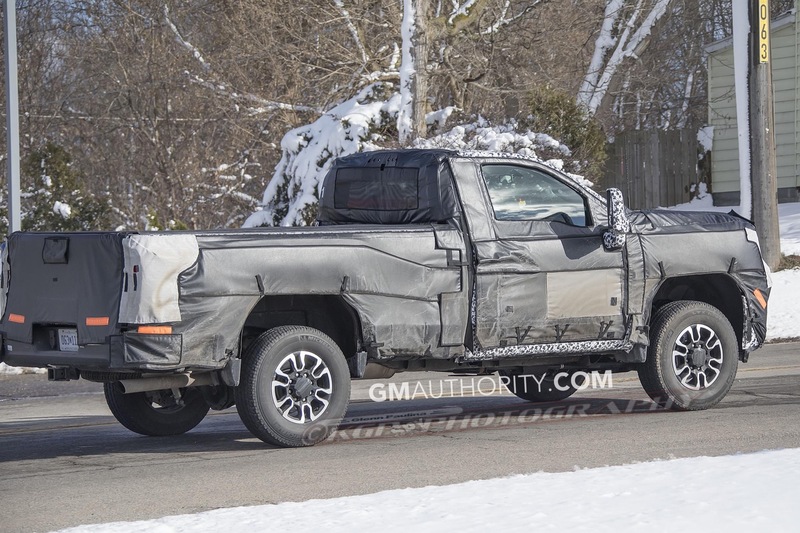 But in honesty it looks really good. 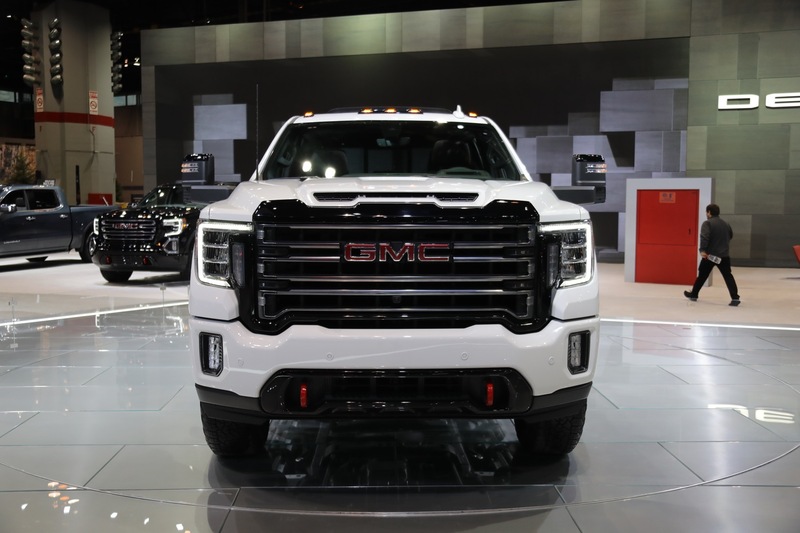 401 HP and 464 lb-ft of torque. 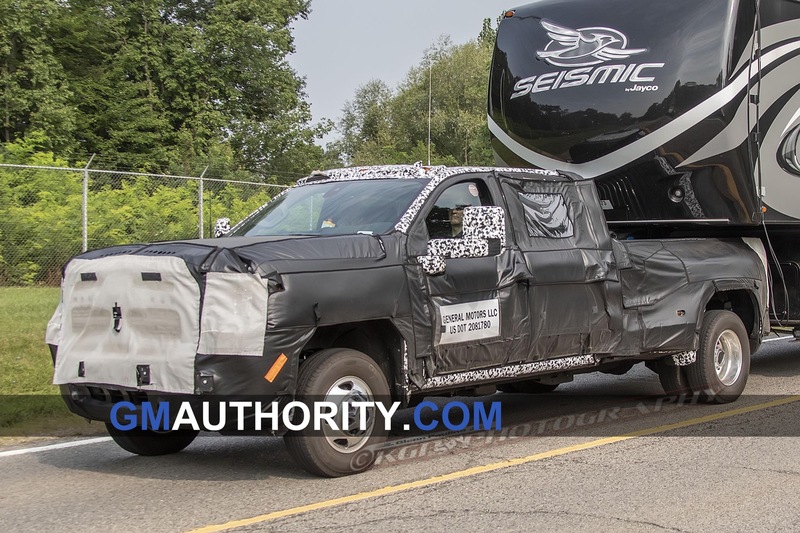 Im curious to see at what rpm’s that 464 ft/lb torque is at. 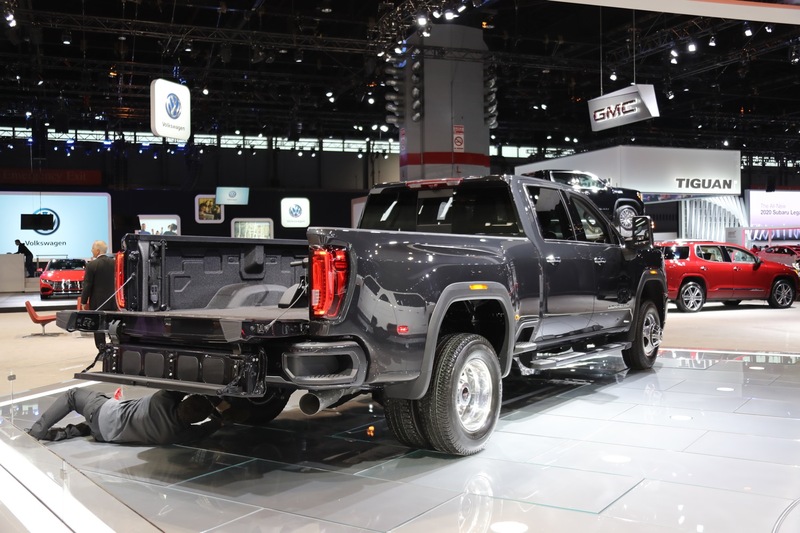 I bet its really low with a 6.6 and direct injection. 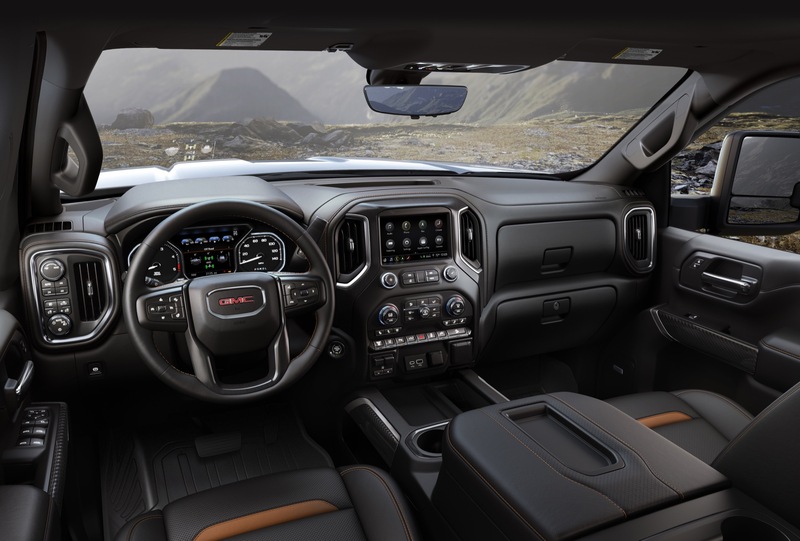 The 6.0 was putting out 90% power at 2,000 rpm. 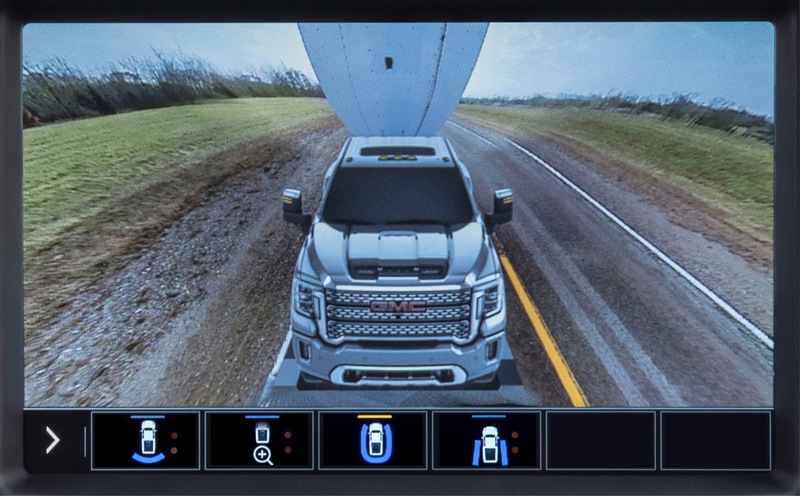 I bet the new engine has 400 whenever get on the throttle. 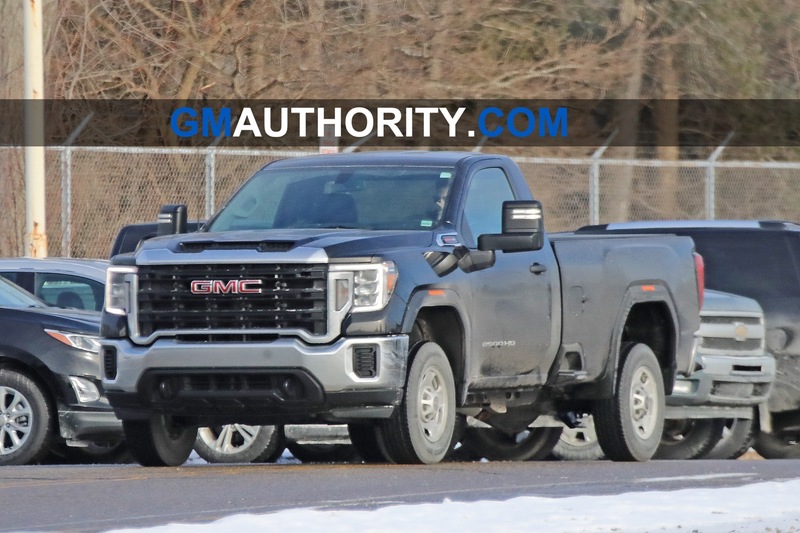 Also max tow rating of 35,500 lbs and max payload of 7,466 pounds. 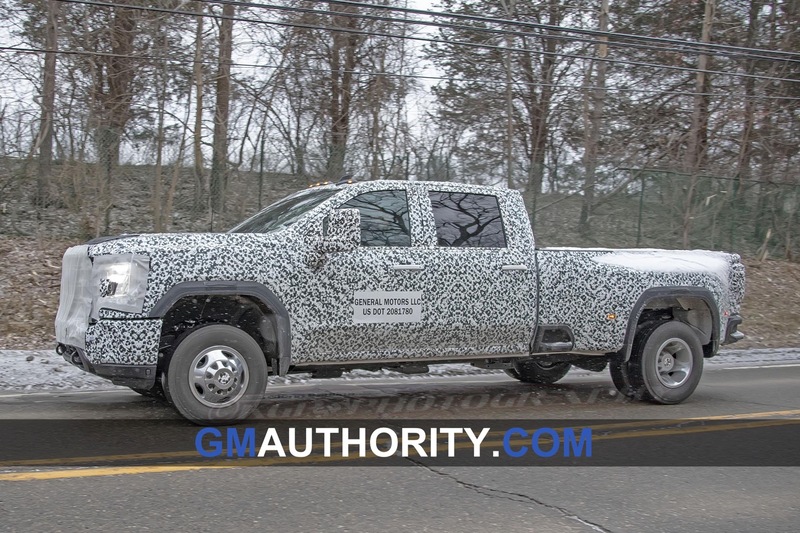 Per TFL truck and Autoblog. 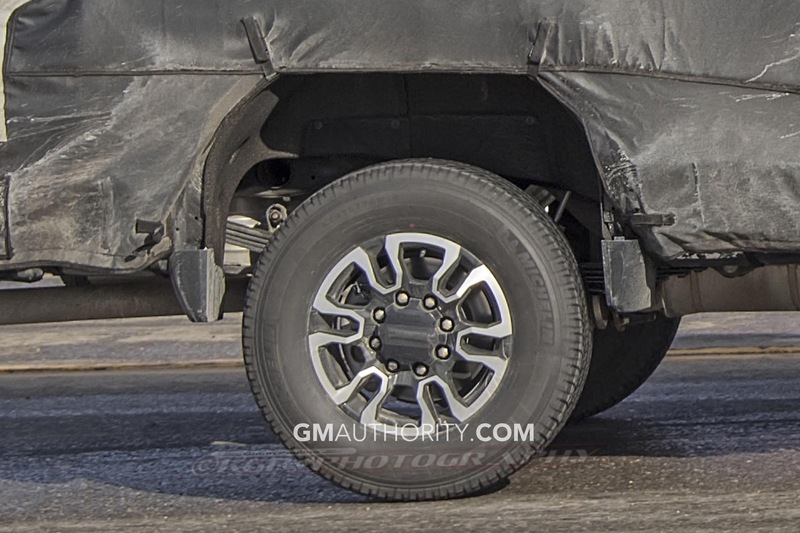 Is it going to be a 6.6 or is it a 6.2? 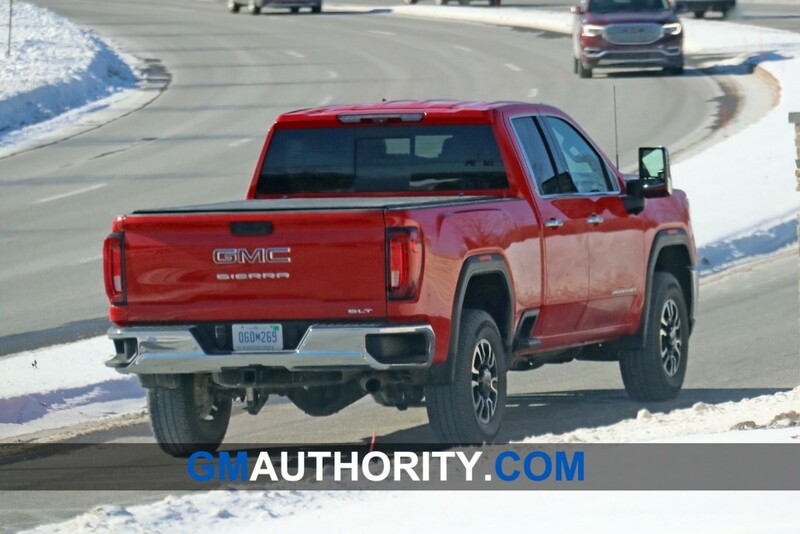 Did GM actually confirm that? 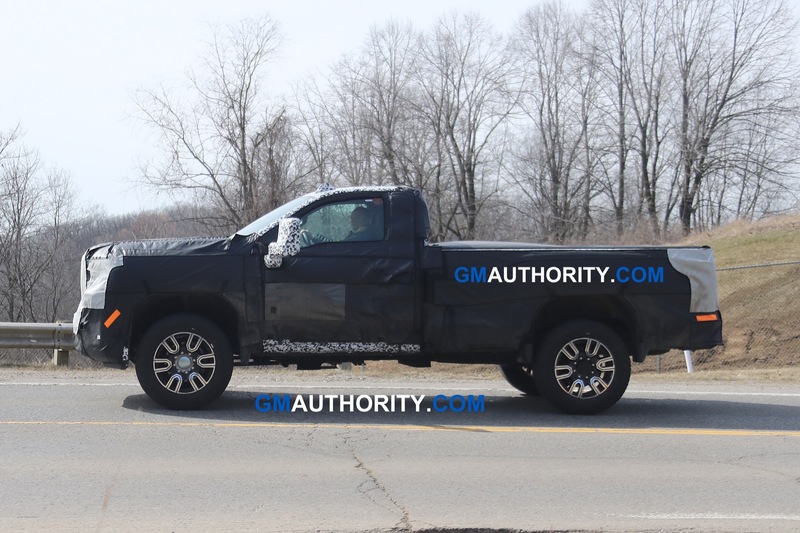 For the first few months i never heard anything about a 6.6 V8 any where except on this sight. 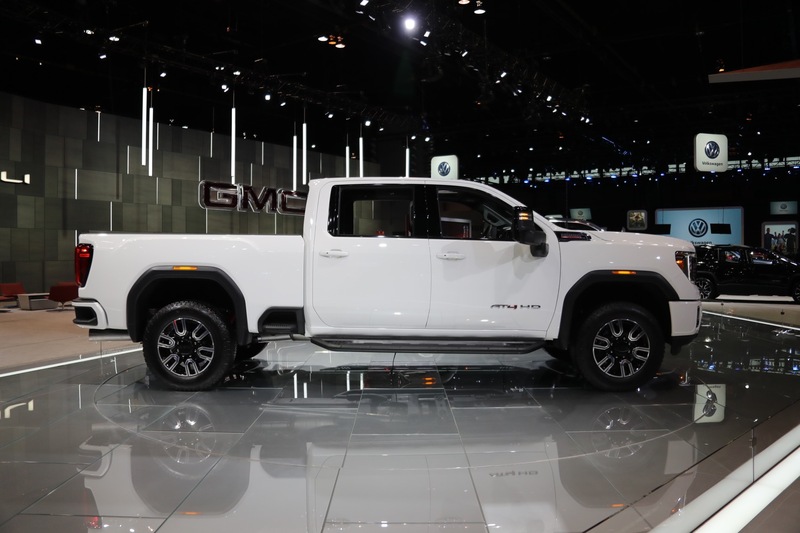 I wasnt aware GM said anything about it. 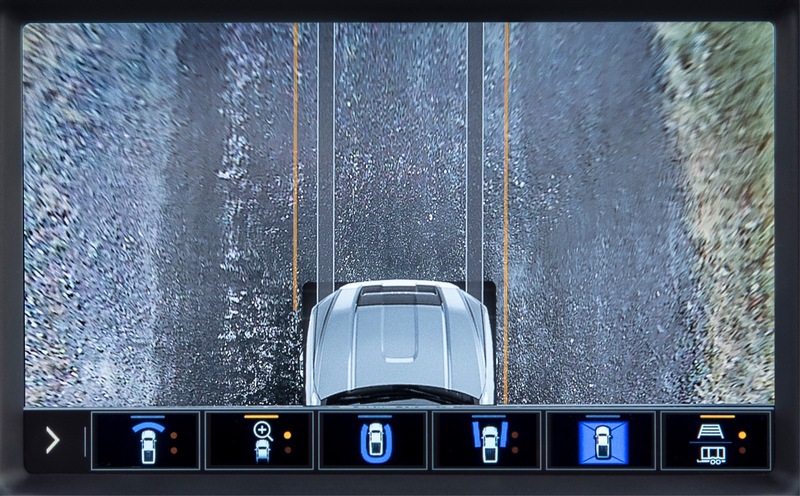 Im all for it though. 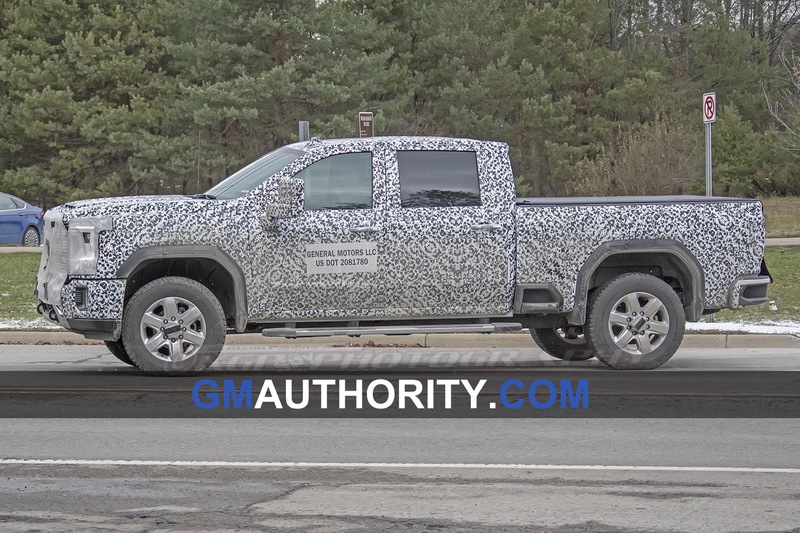 Look on Chevrolets website, its been updated with information on the 6.6L V8. 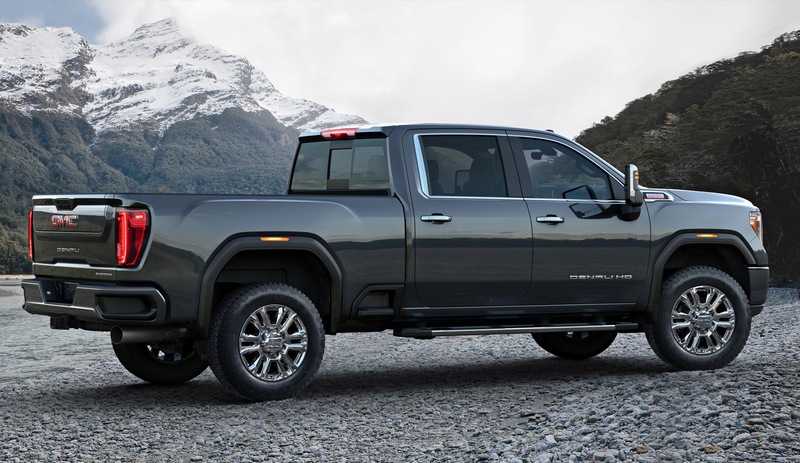 Is it just me or does the double cab look better proportionally than the crew cab. 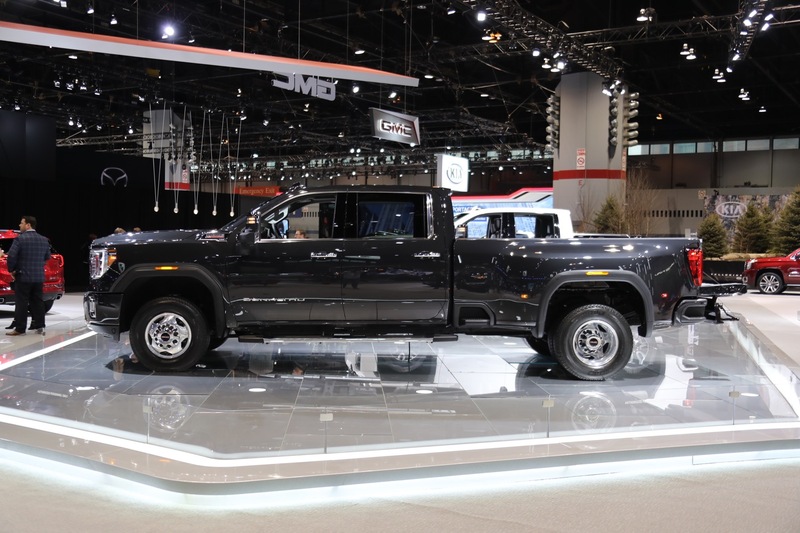 It looks much better than the crew cab, in my opinion, not to mention a little smaller which would fit my needs. 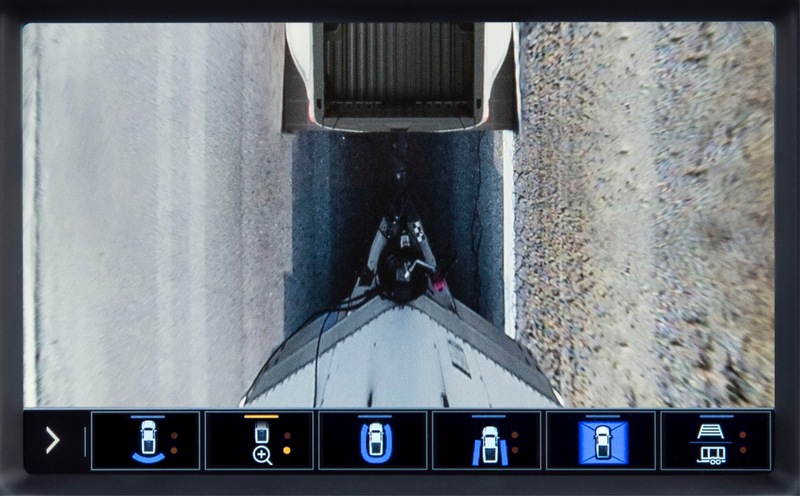 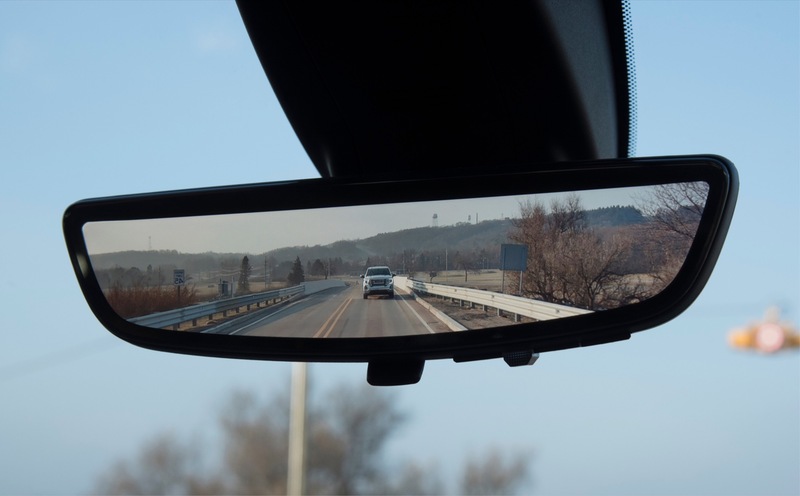 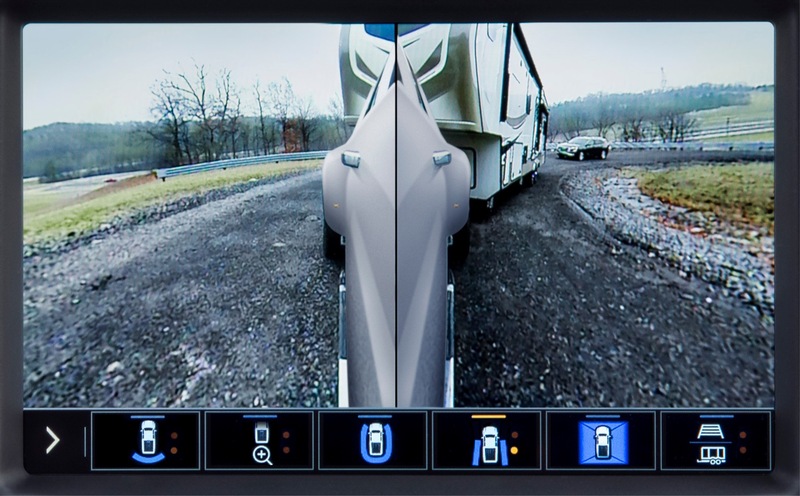 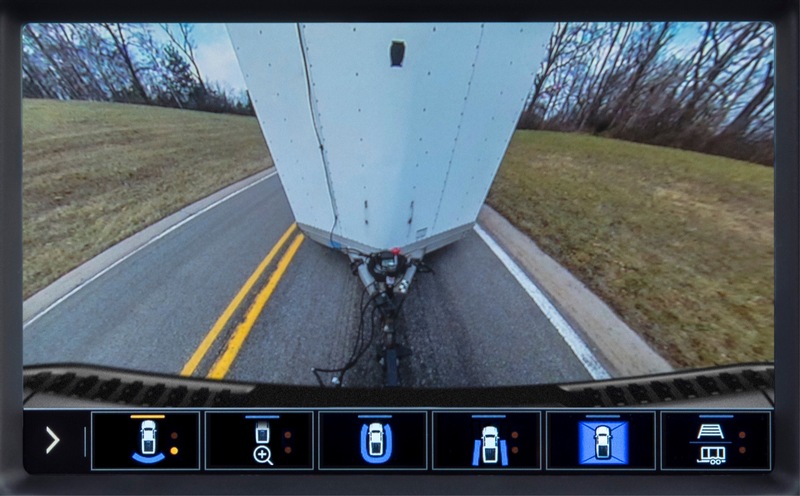 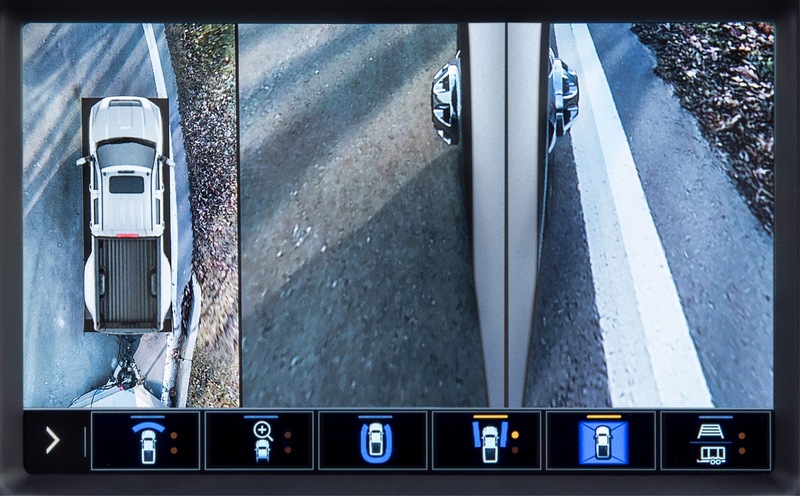 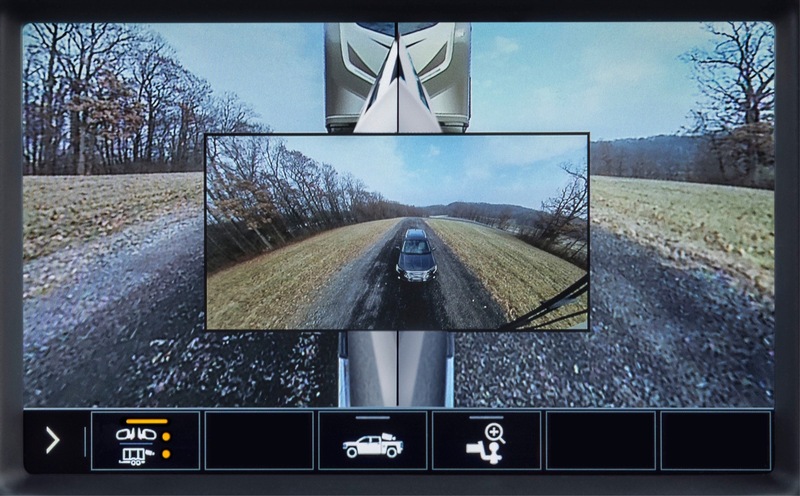 I’m wondering if you could choose which side mirrors as I like the regular mirrors that the 1/2 tons use. 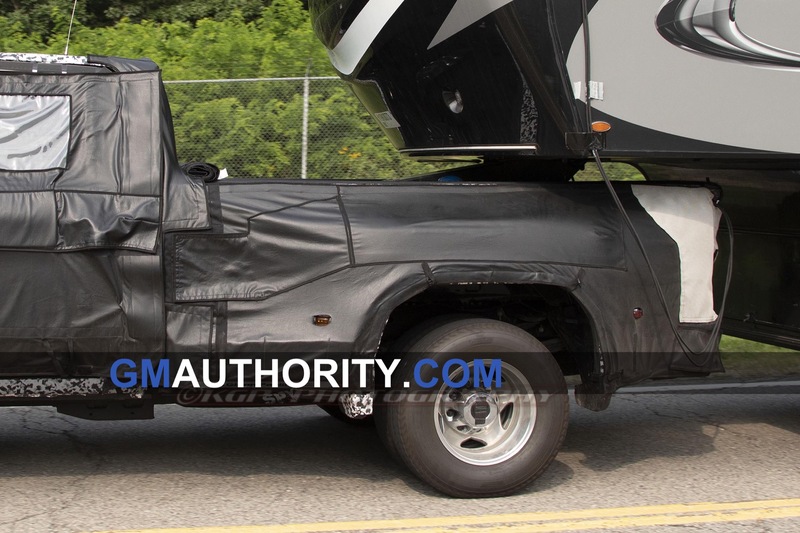 is this the 6.2 from the 1500’s? 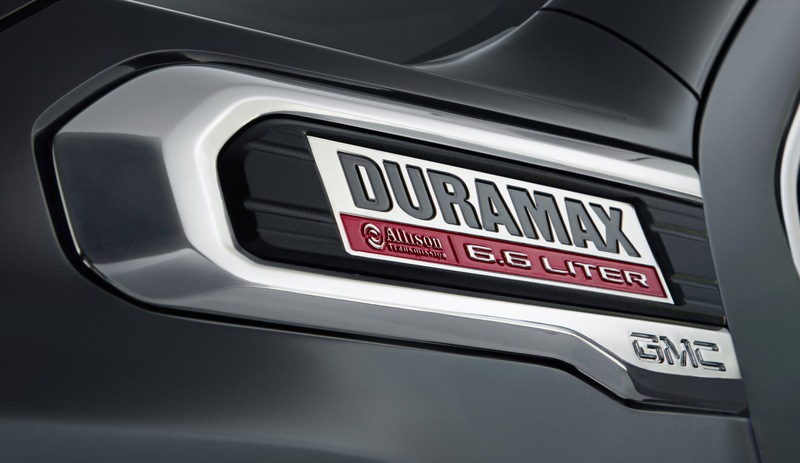 I really cannot see any engine with AFM or DFM or whatever its called being nearly as reliable as the 6.0. 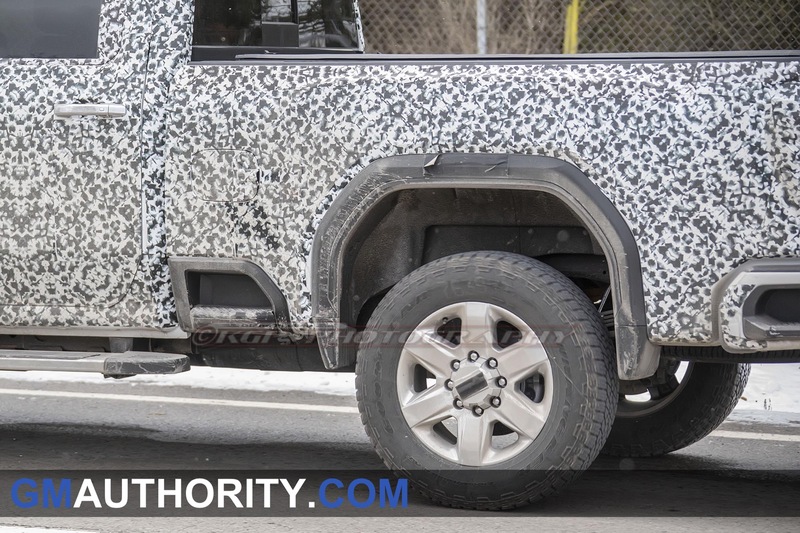 No, its the new 6.6L. 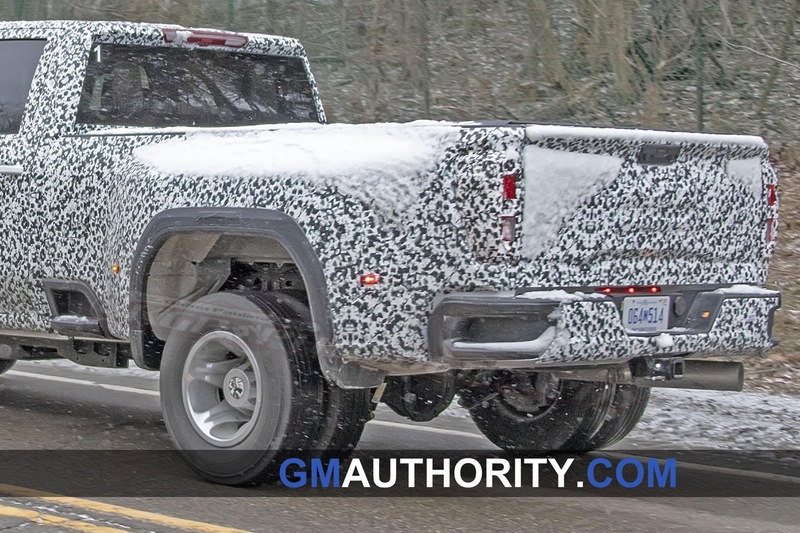 No, it shows 6.6 just like GM has already announced. 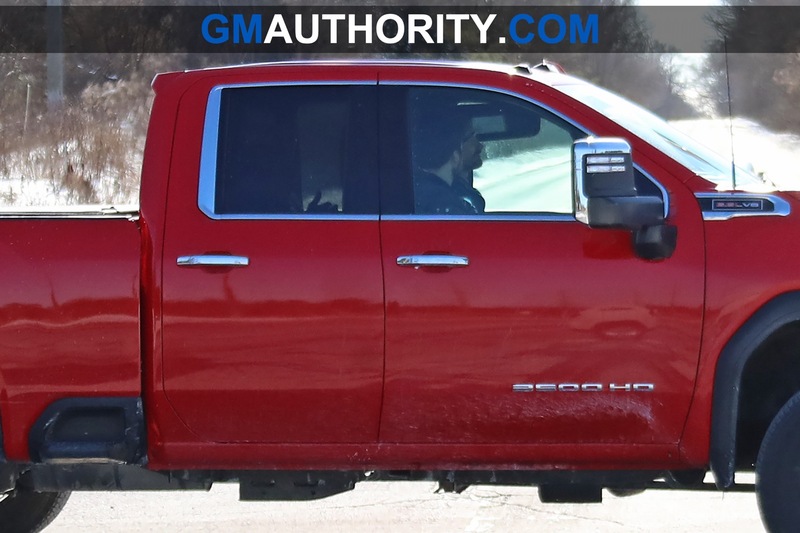 The new 3500 HD badging (that’s what it actually says) is very bad stylistically. 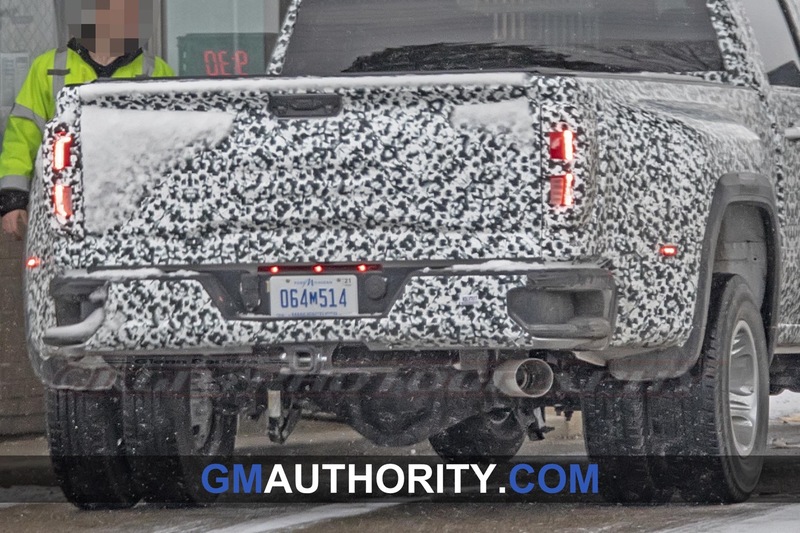 It’s crunched down so hard the 3 and the 5 just look like chrome rectangles, and that’s all anyone will see from even a short distance. 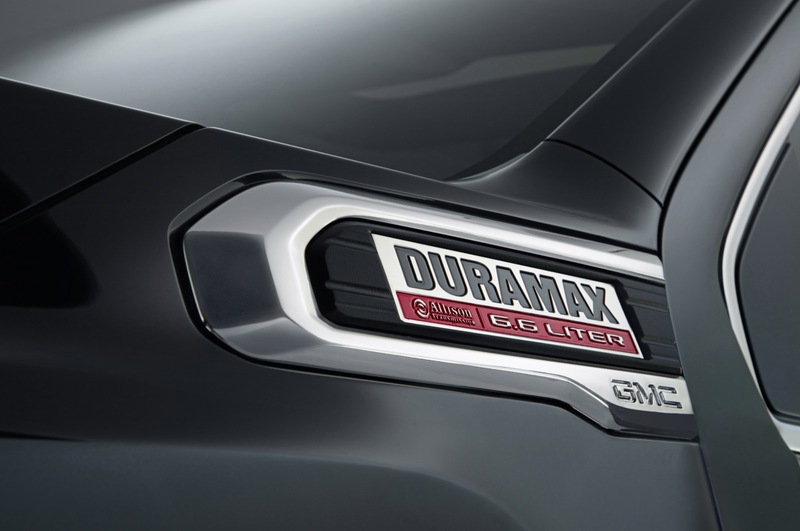 GM should definitely stretch the lettering vertically to make it easier to read and better looking. 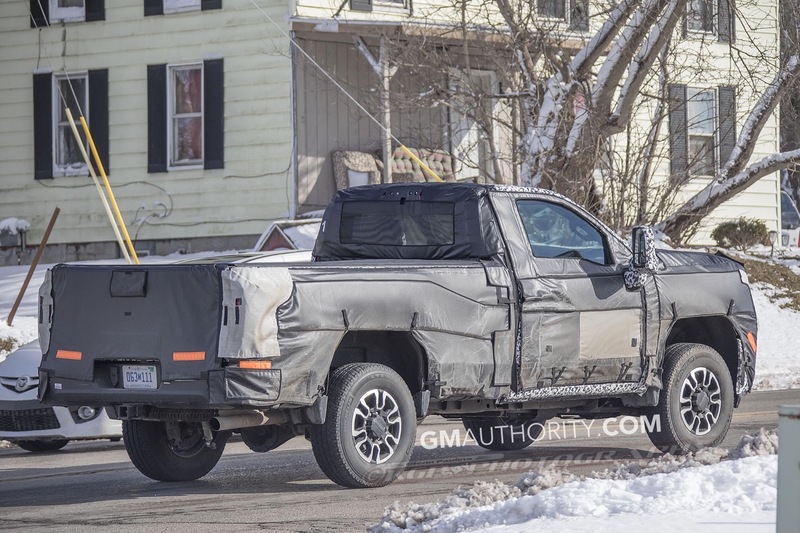 Notice the hood scoops? 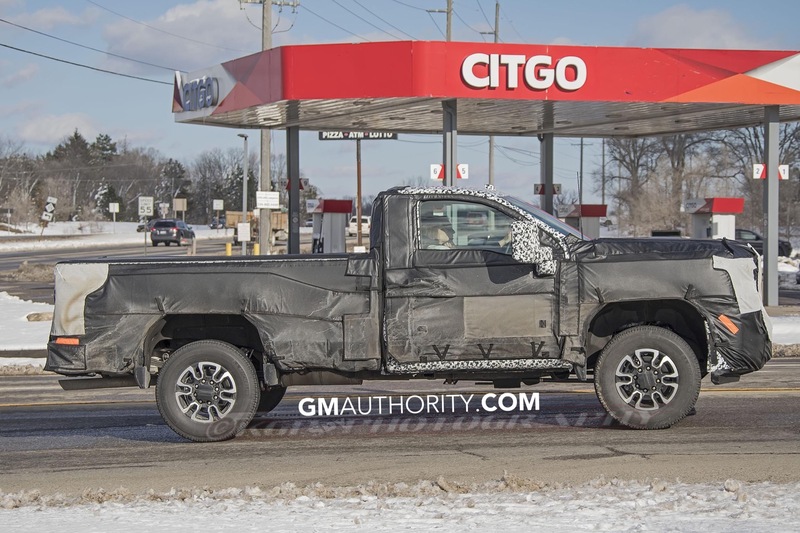 Ram air 6.6? 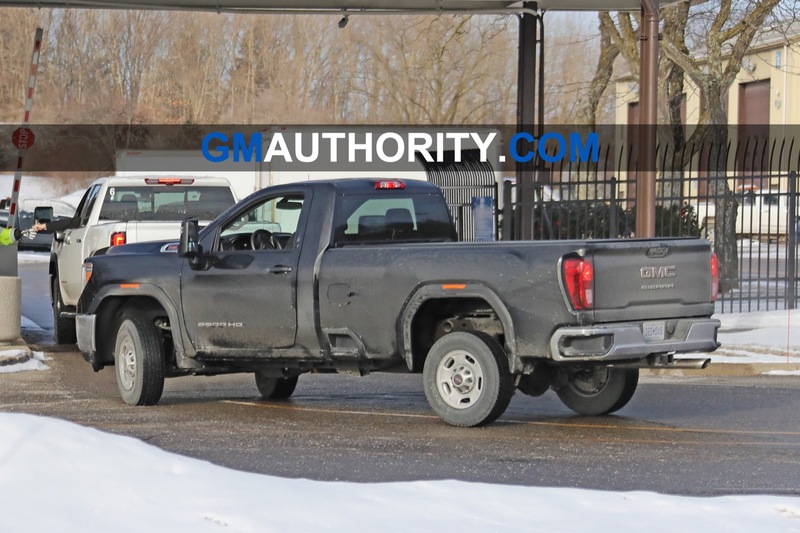 I was read one hour ago saw 6.2 gas but few min ago again reading no there 6.2 look like remove 6.2 to 6.6 gas. 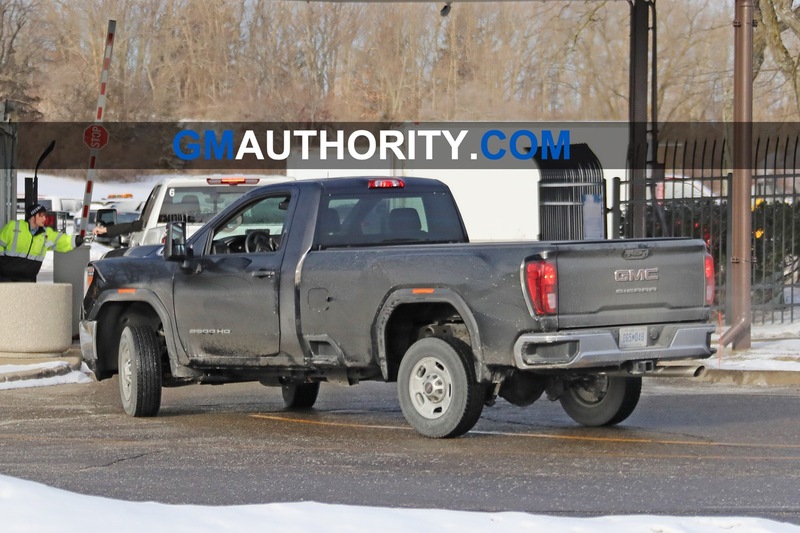 I guess mess up write gmauthority??? 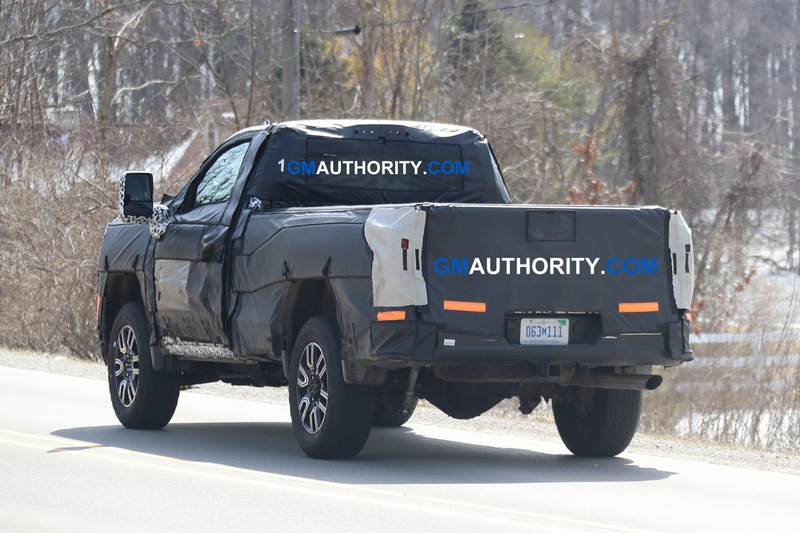 Maybe GMC just stuck the badge insert off a 6.2L 1500 on that 2500 to keep everyone guessing. 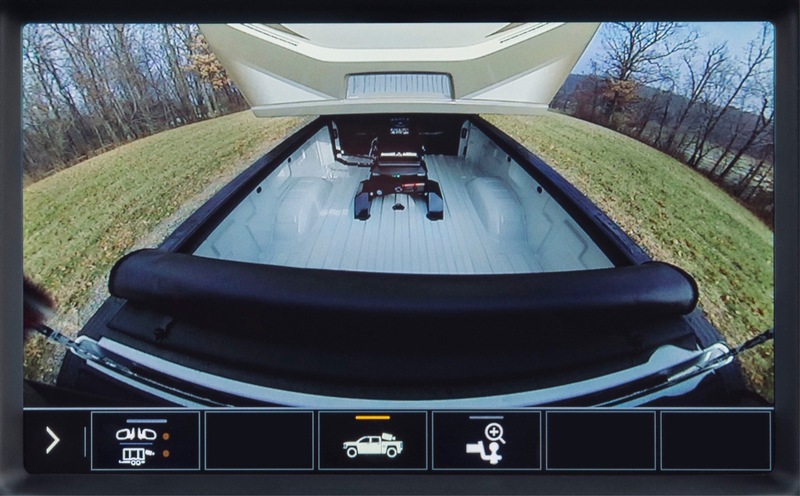 It says 6.6, you can make it out. 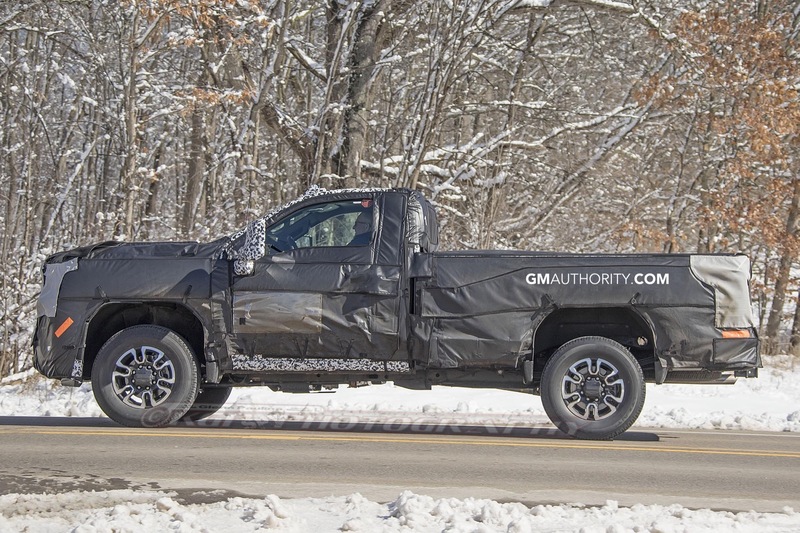 I really like the look of the double cab GMC. 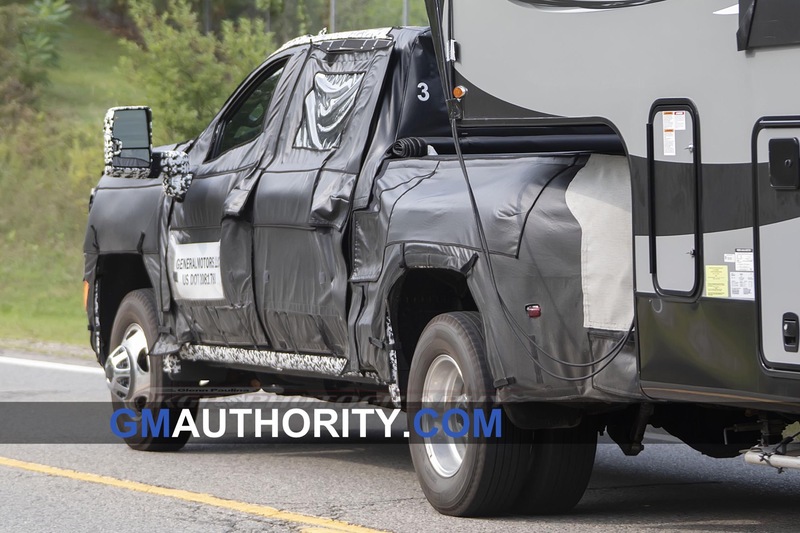 I’m looking forward to seeing it up close this fall.